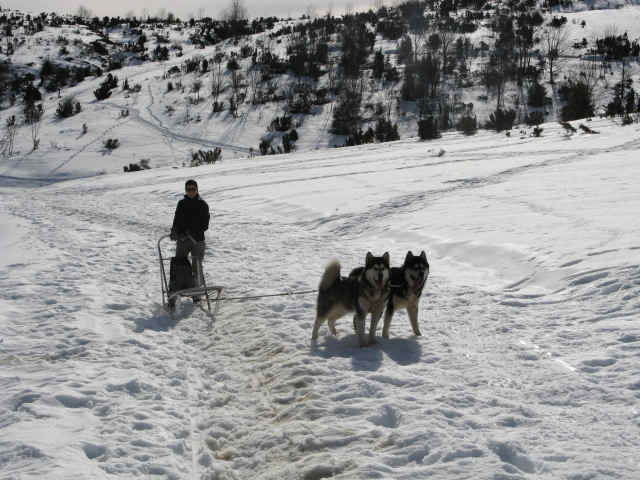 My girl friend and me sledding, and a lot of pictures about sledding. 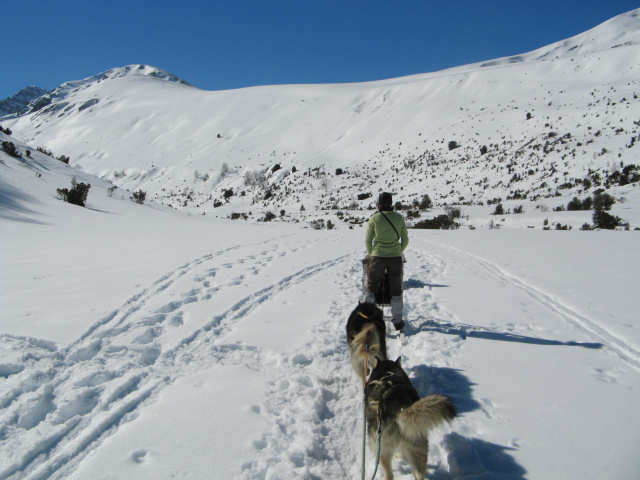 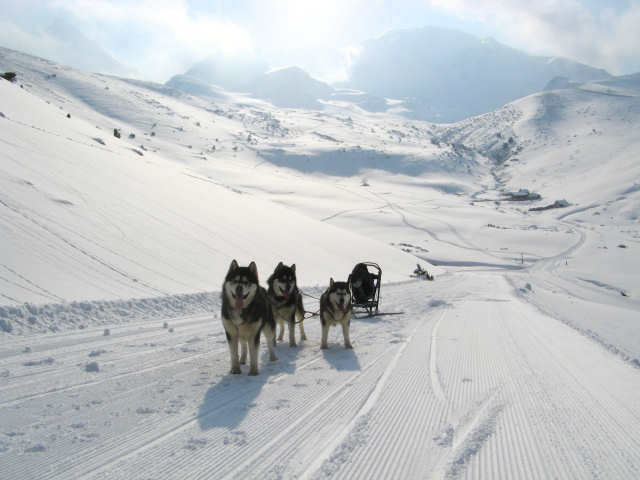 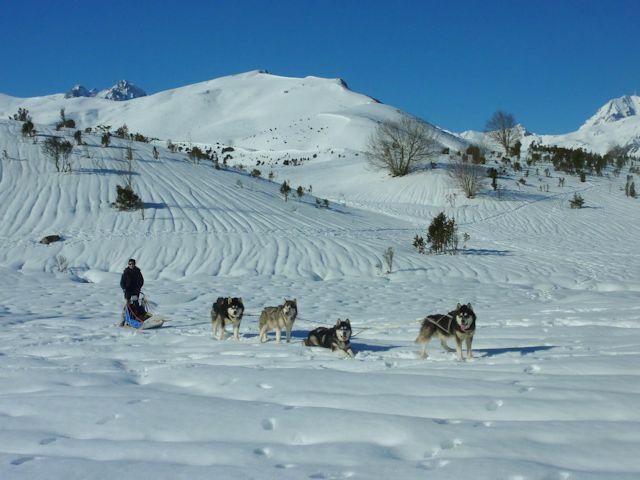 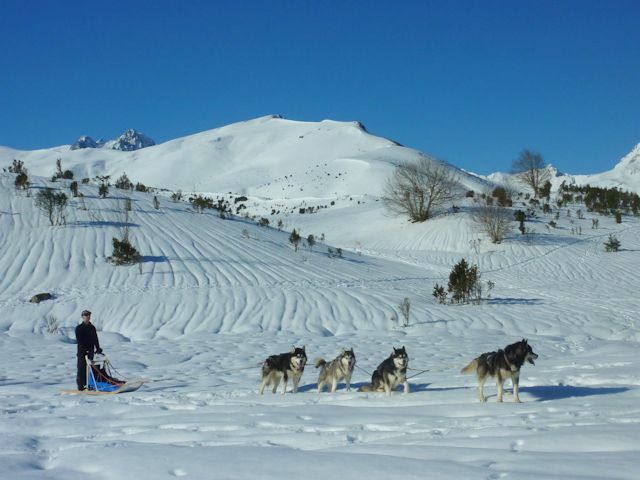 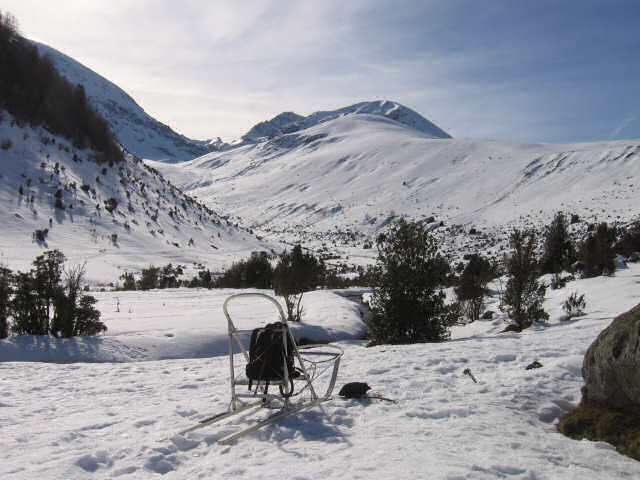 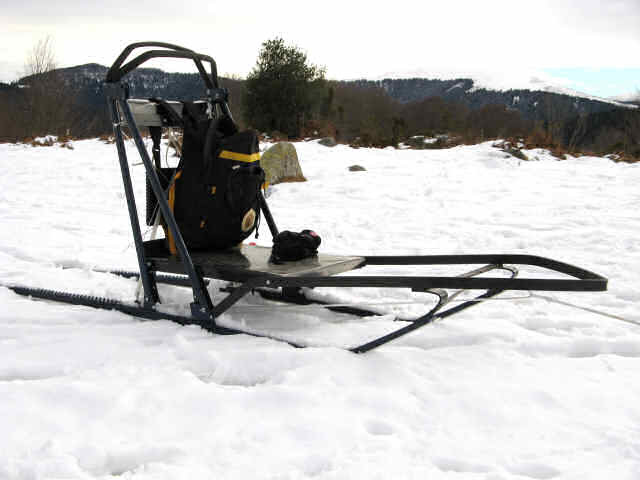 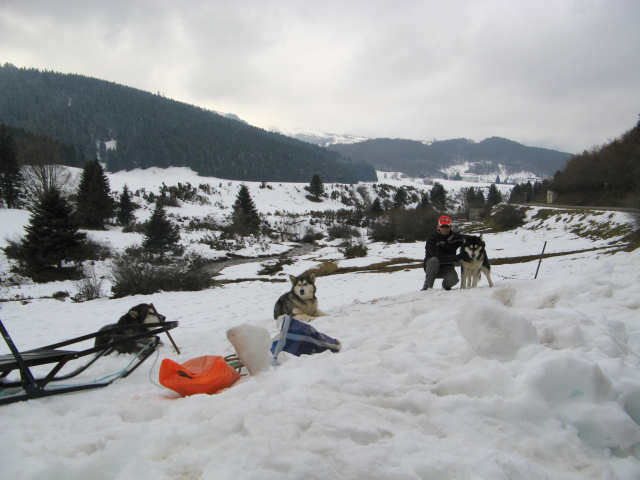 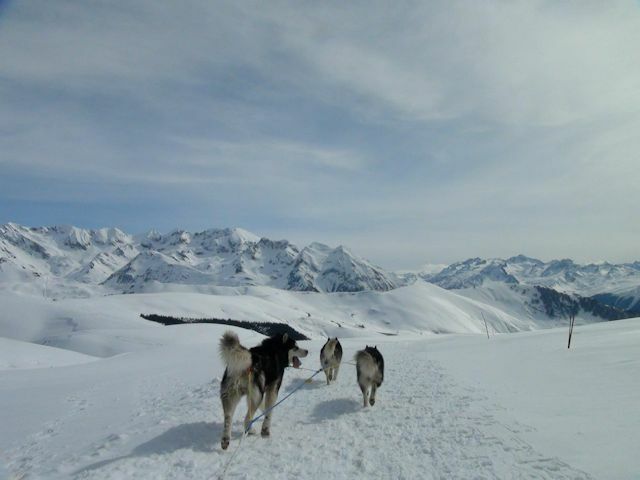 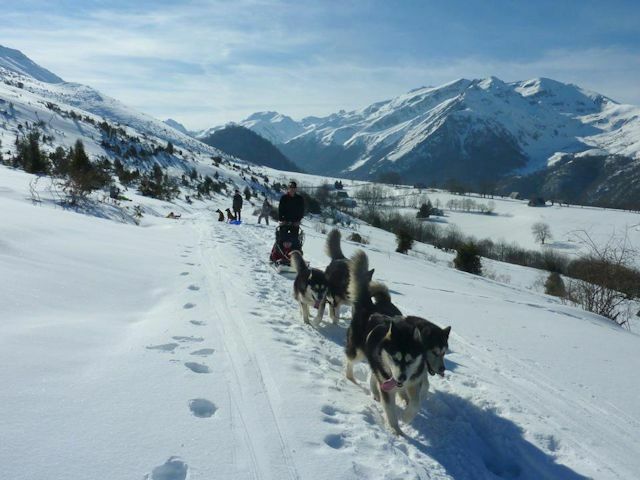 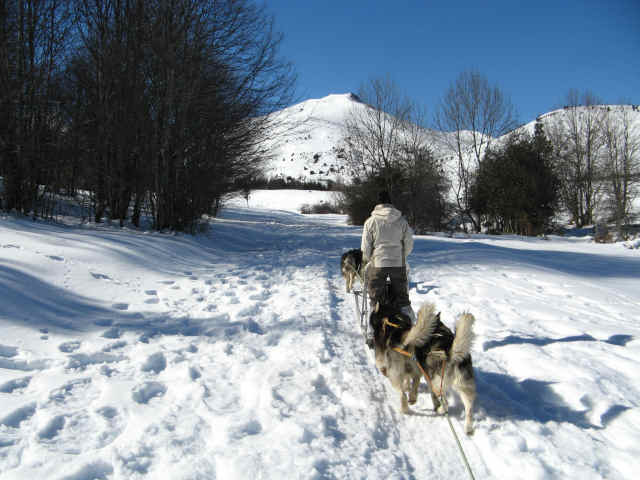 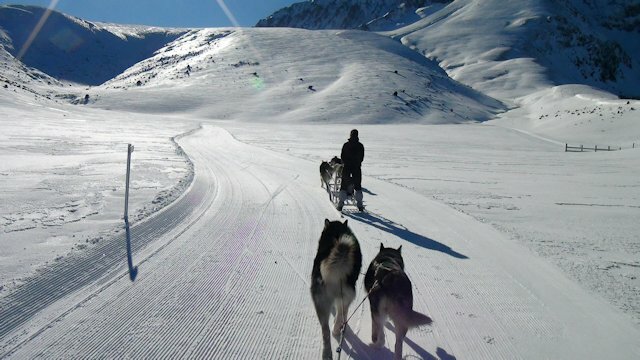 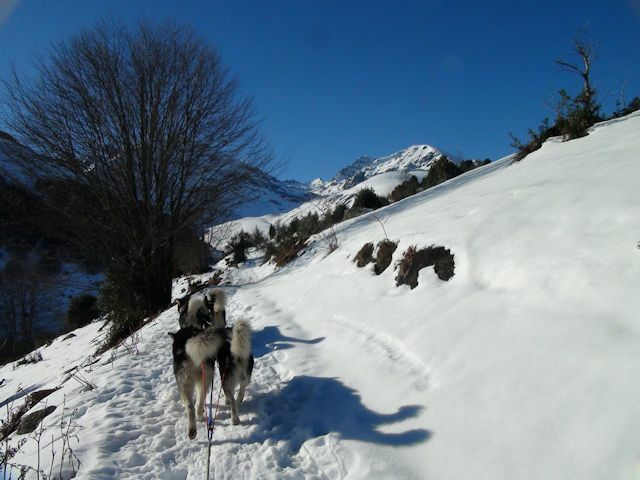 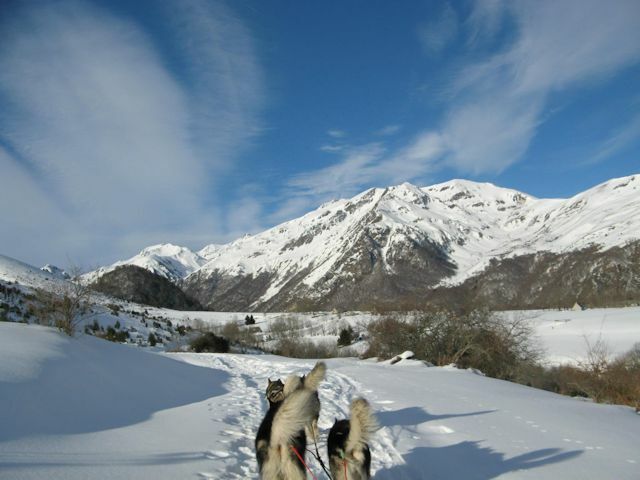 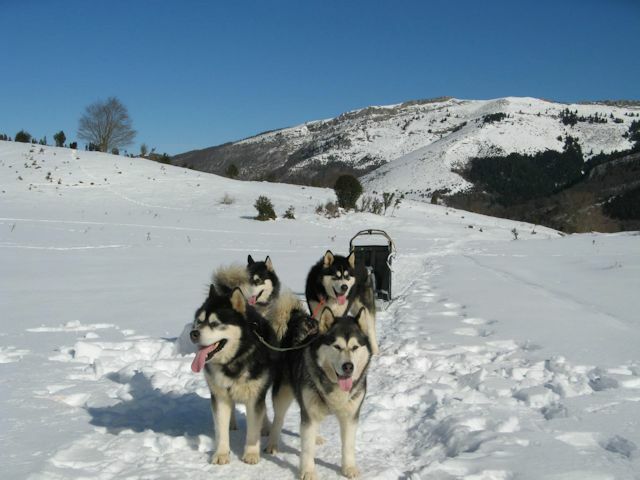 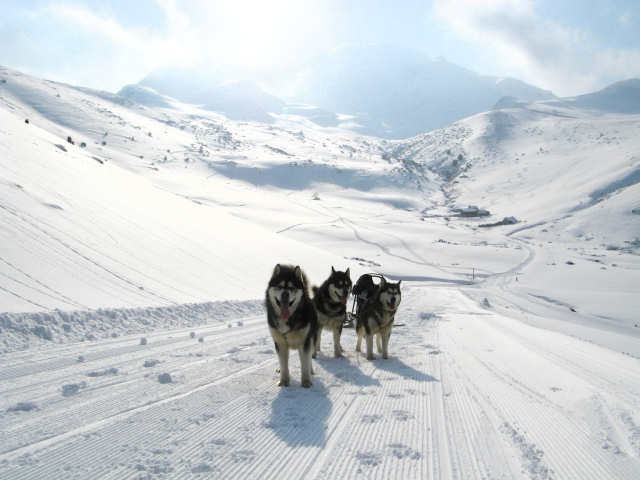 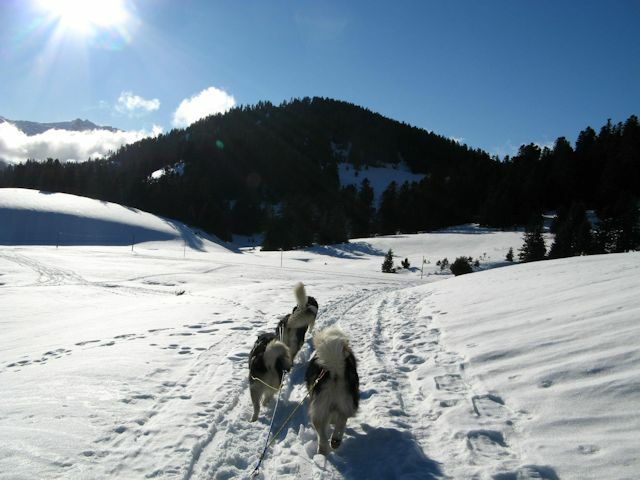 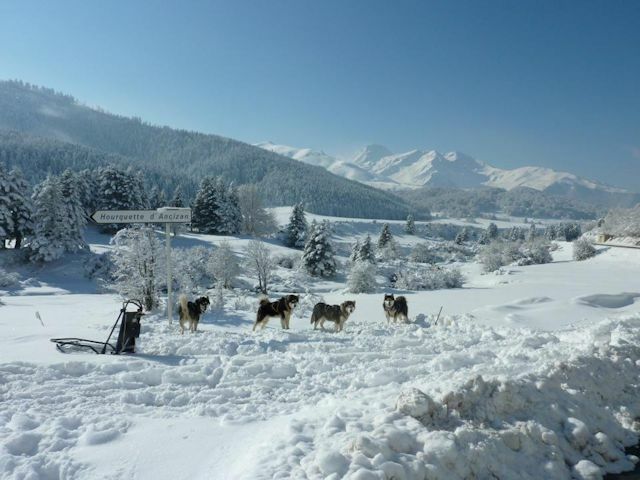 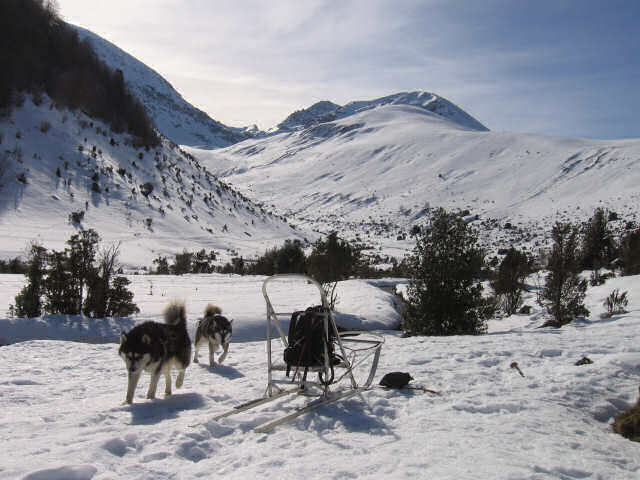 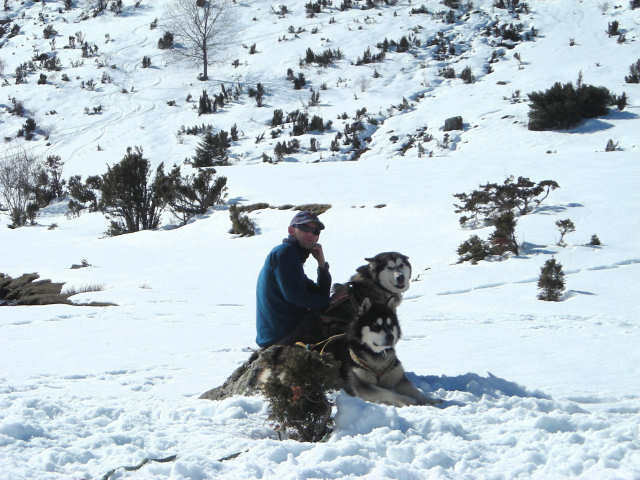 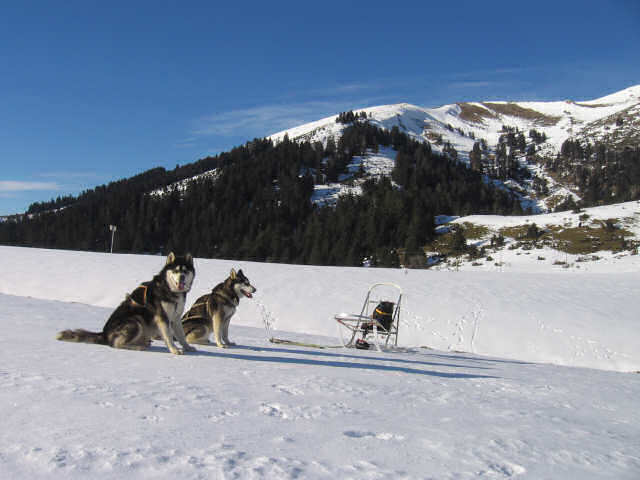 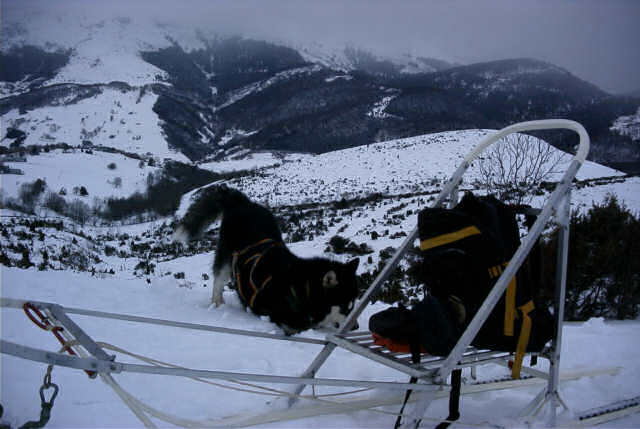 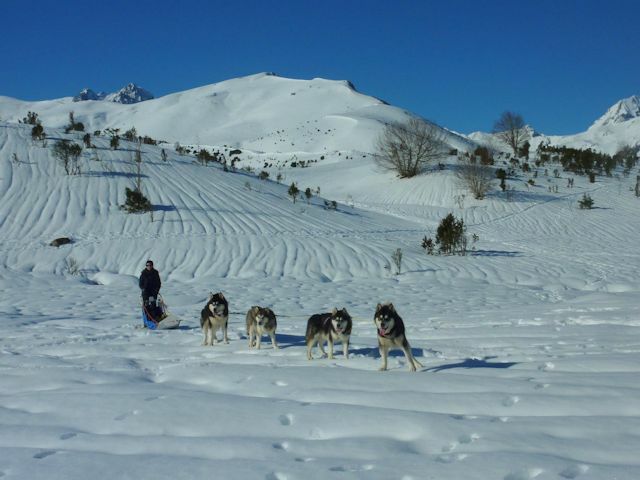 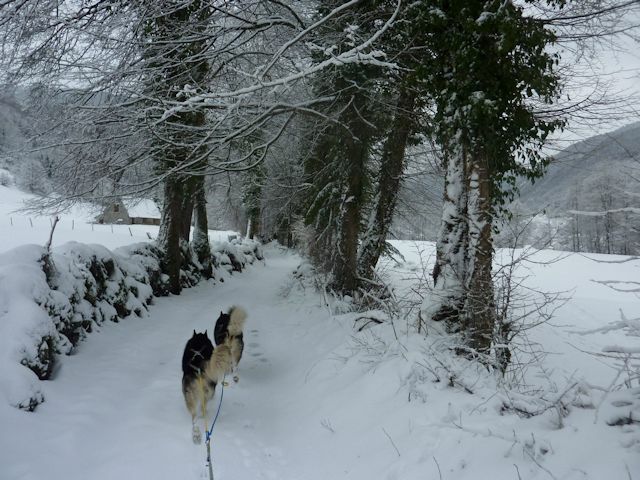 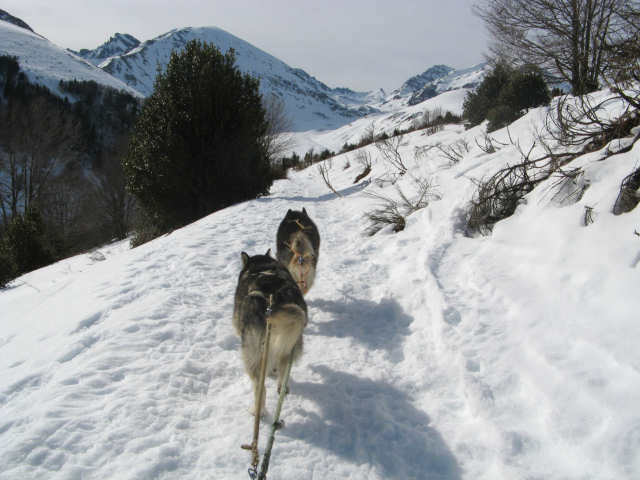 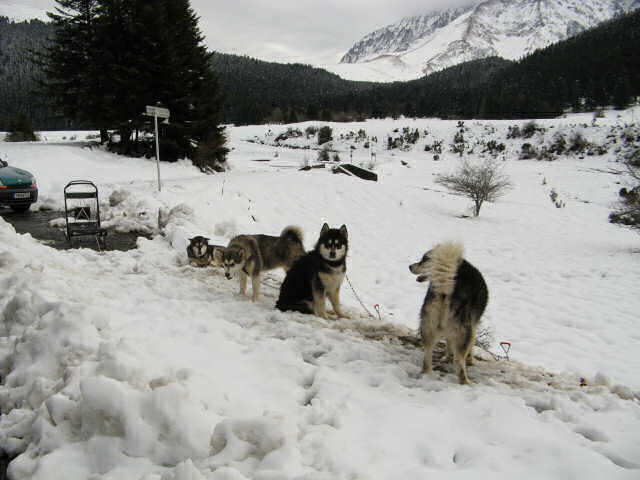 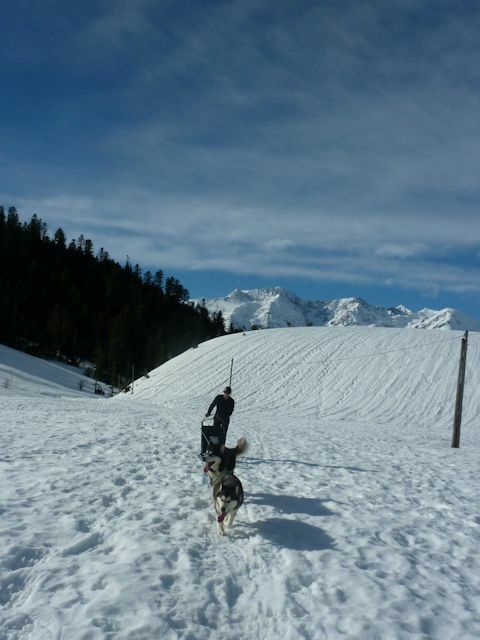 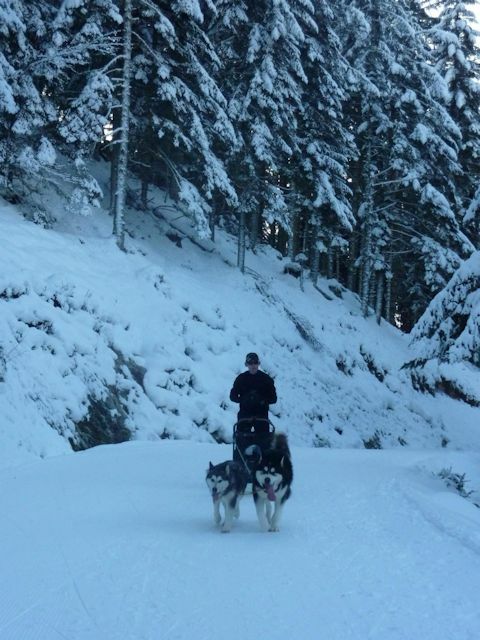 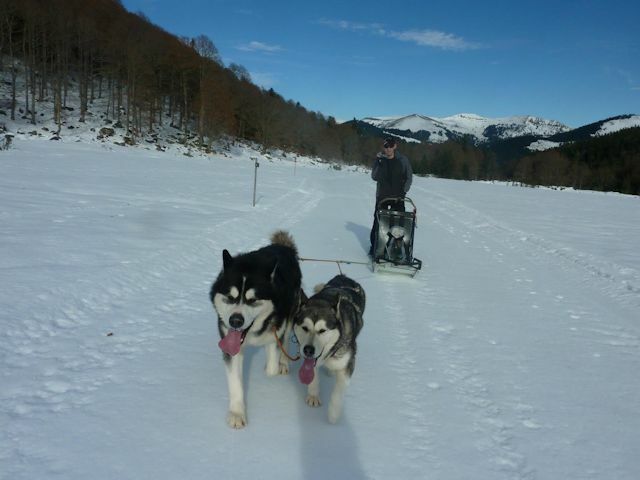 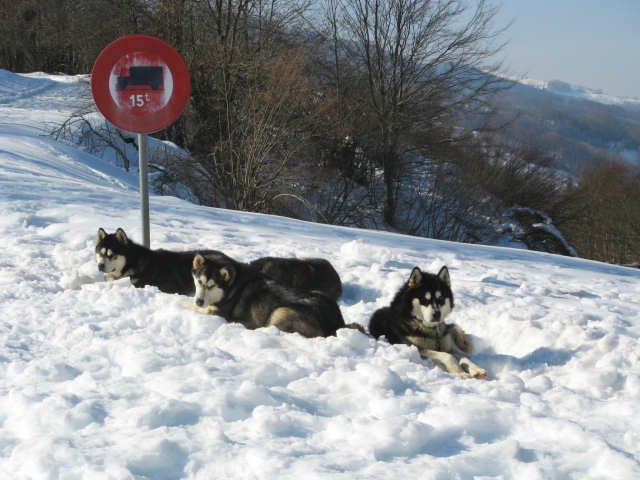 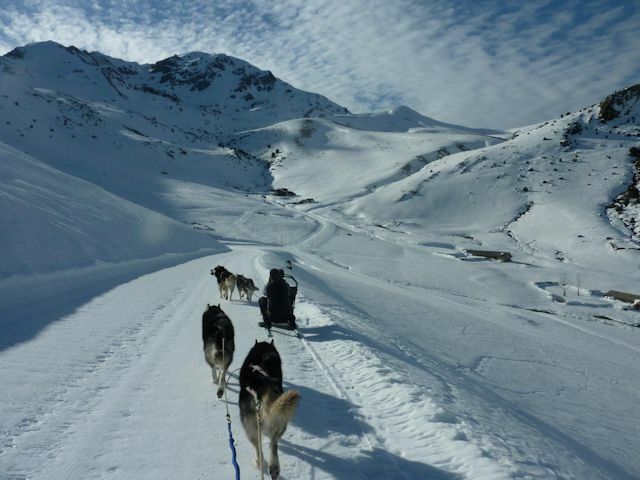 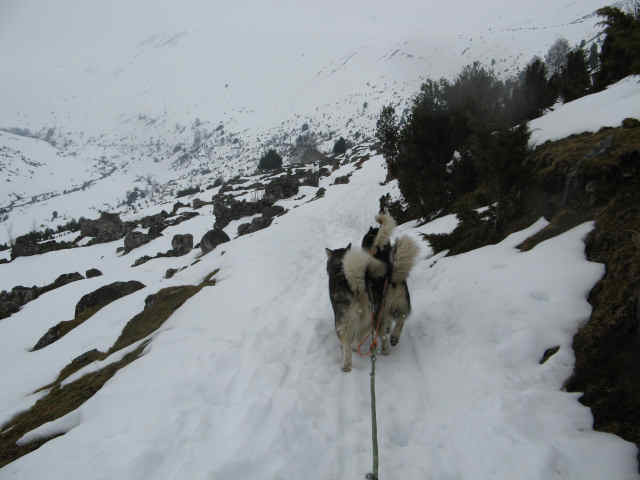 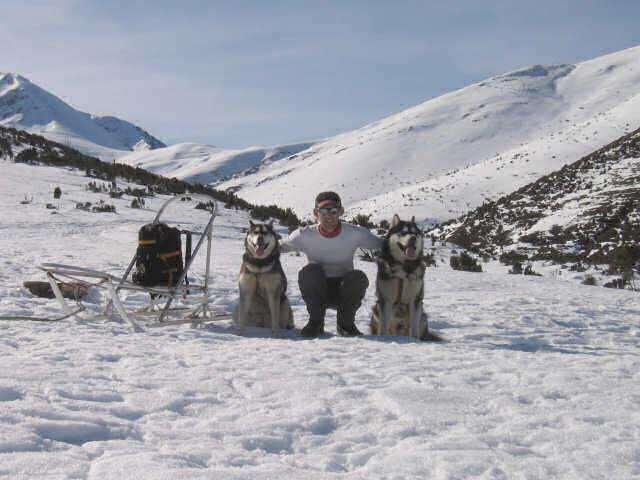 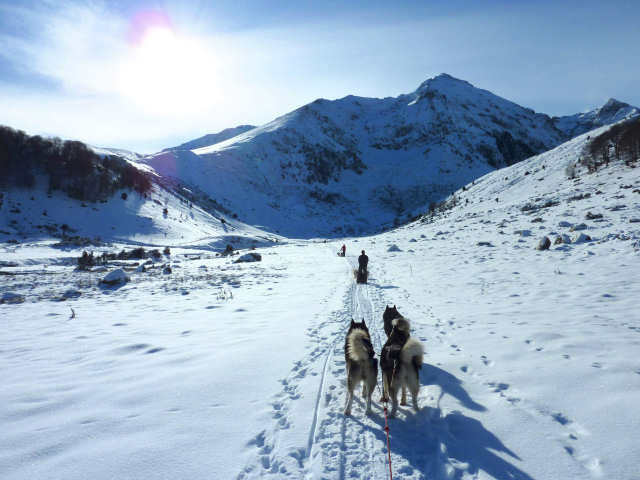 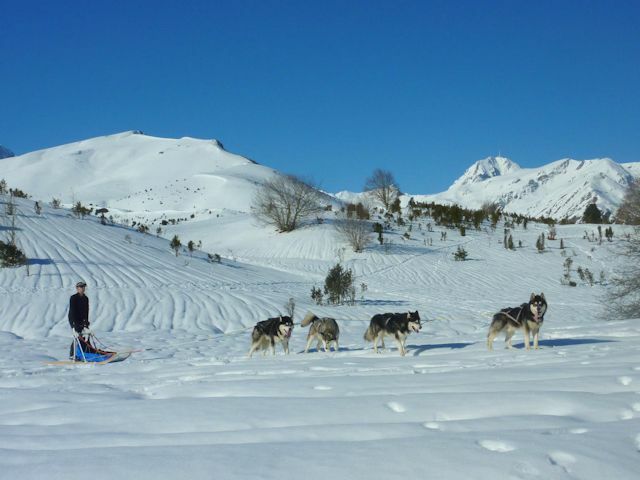 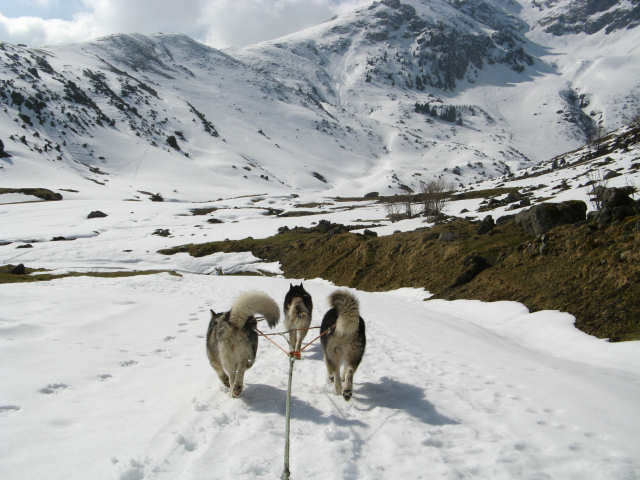 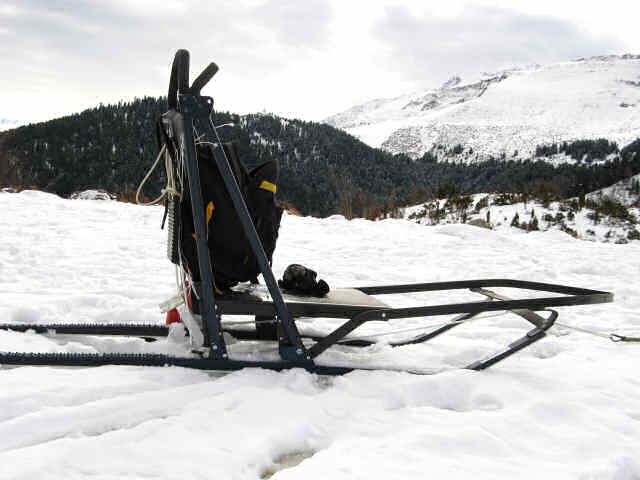 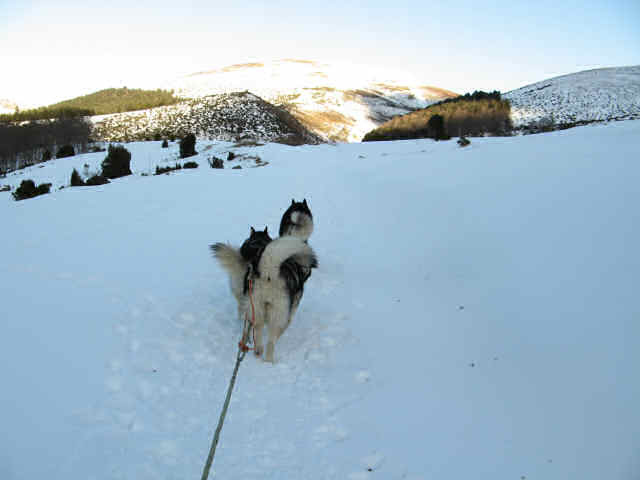 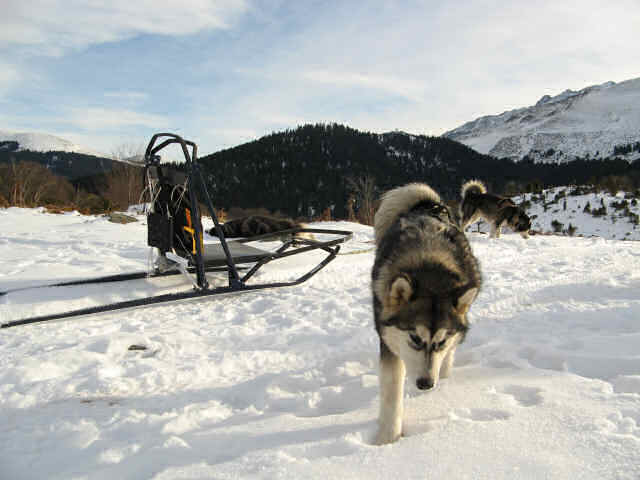 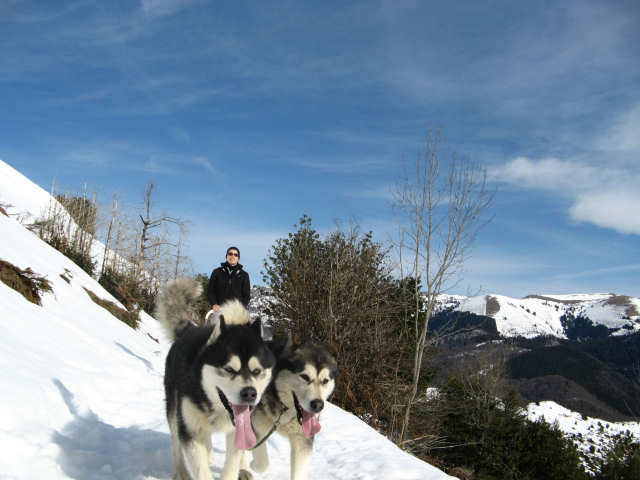 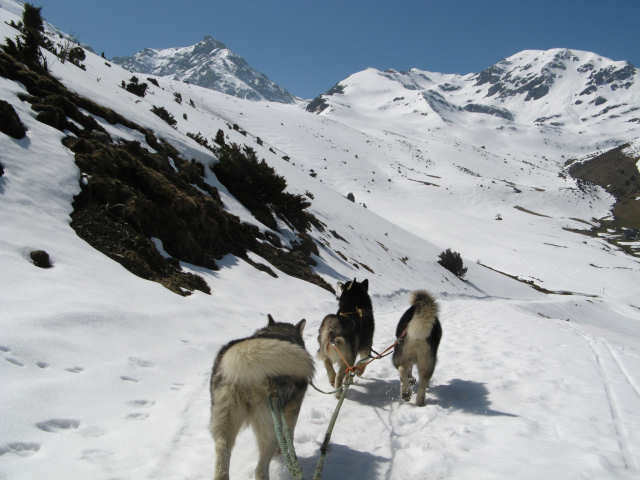 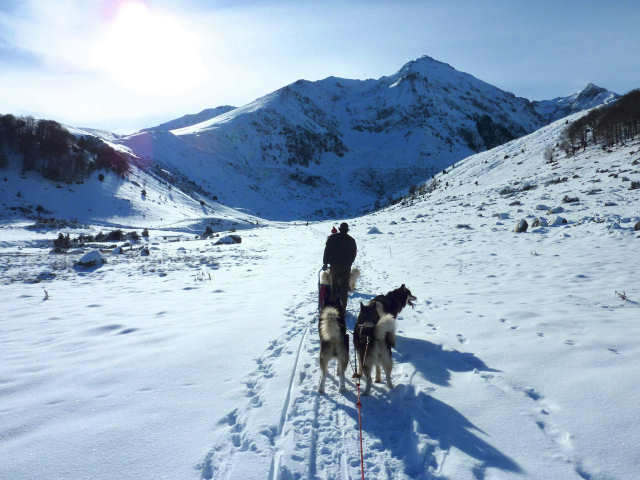 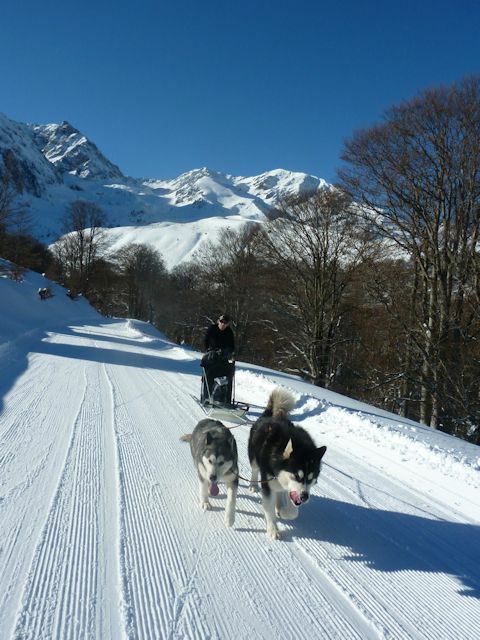 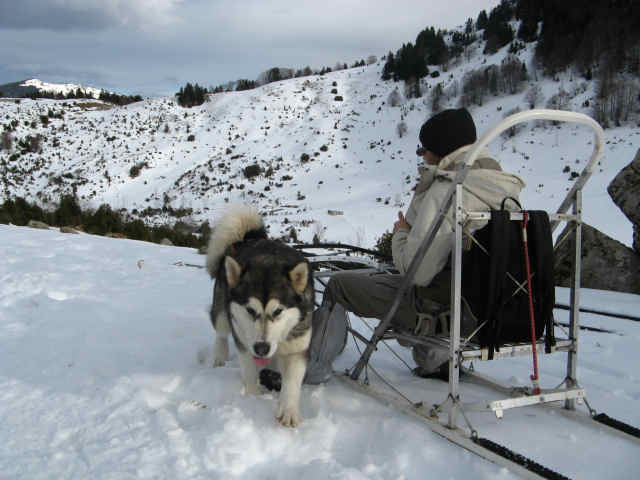 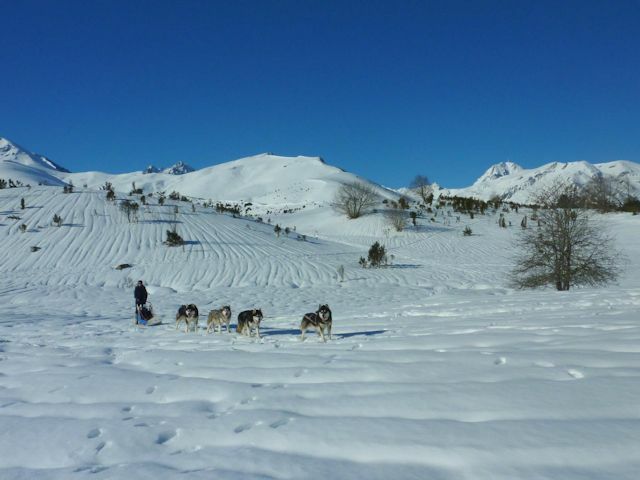 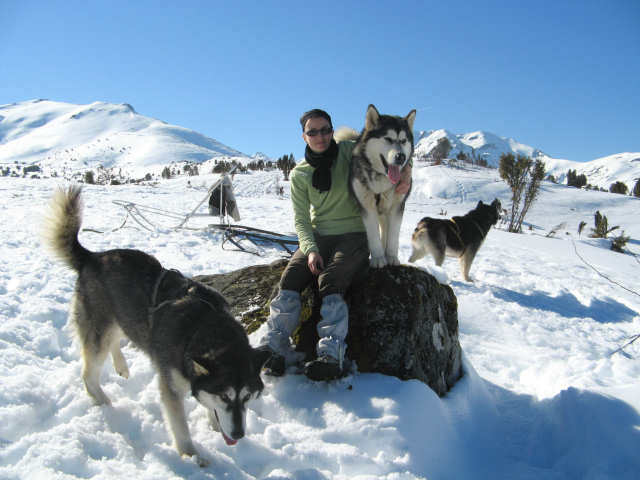 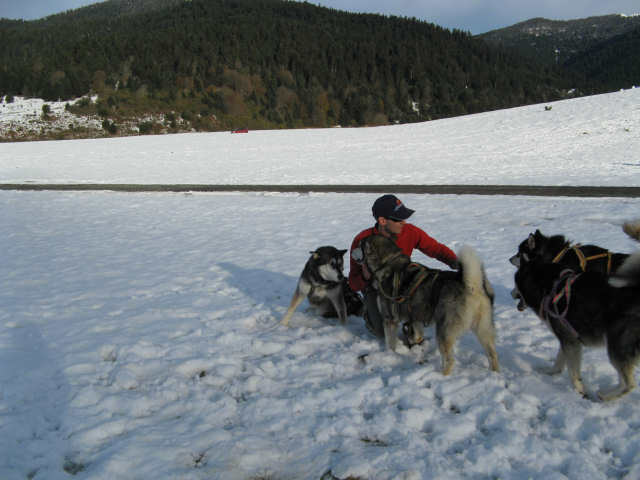 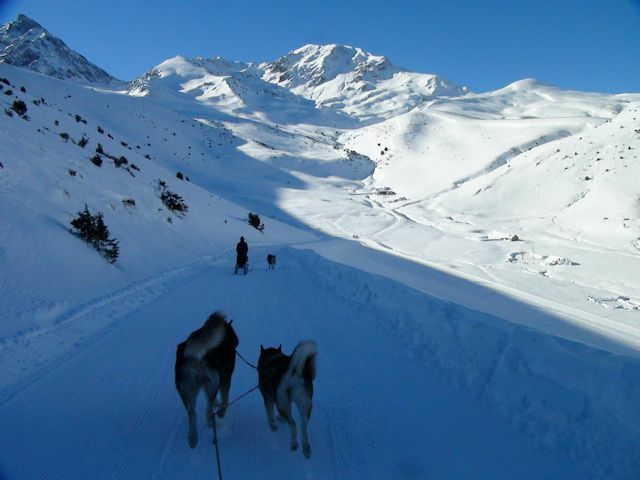 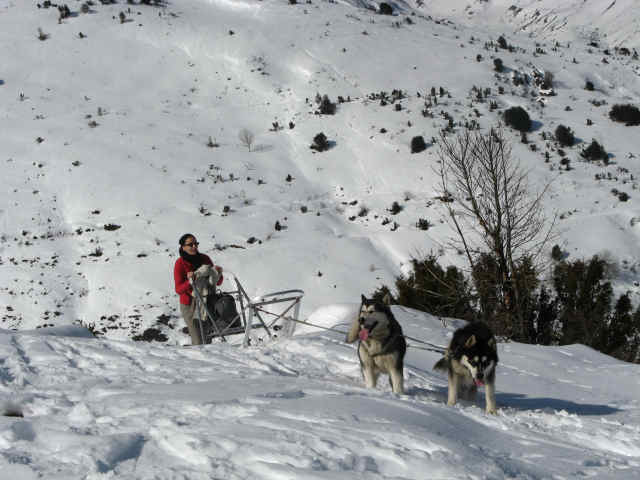 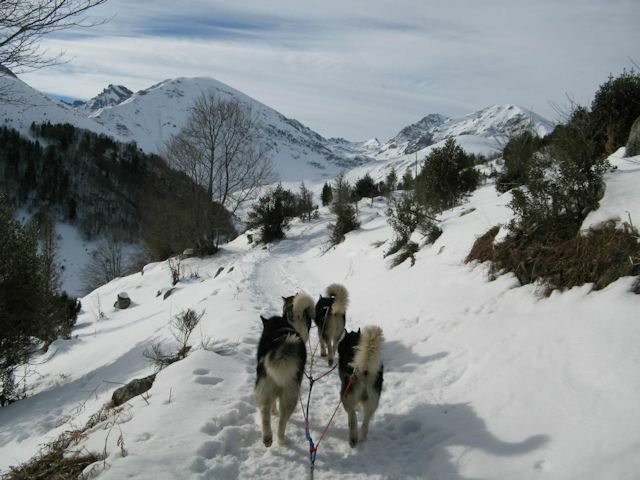 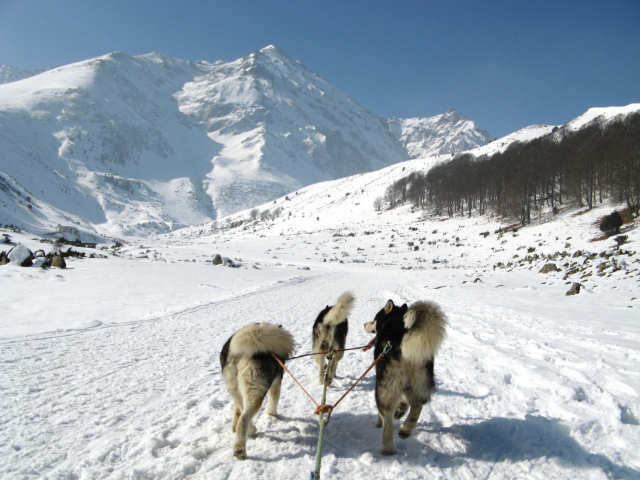 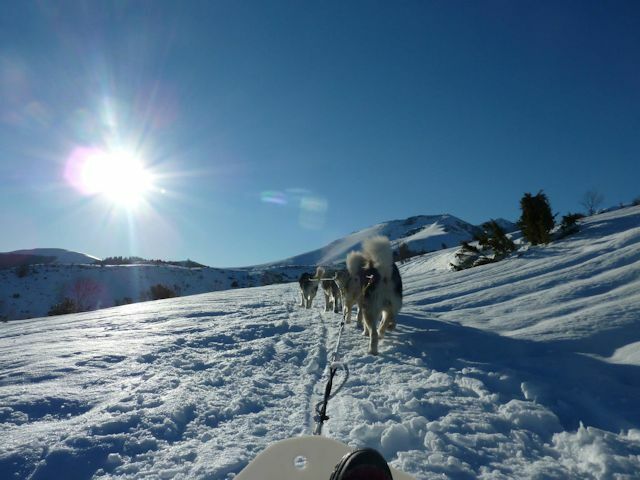 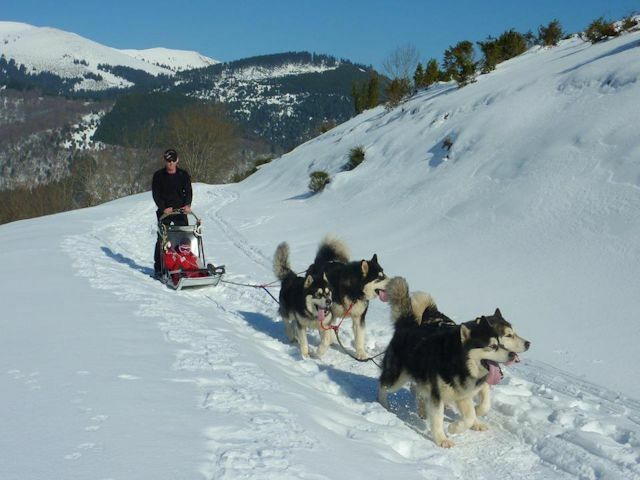 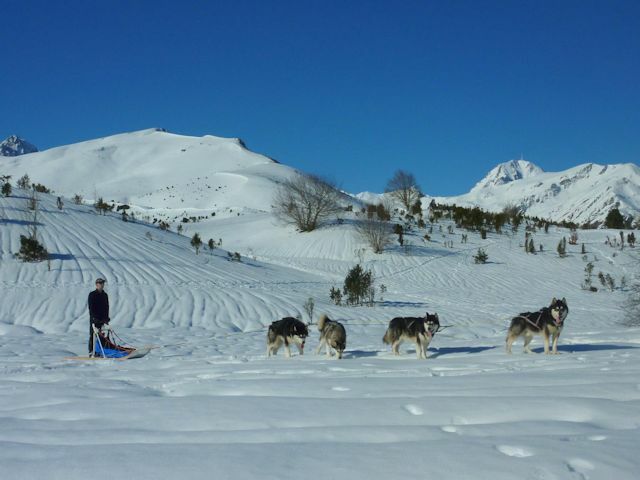 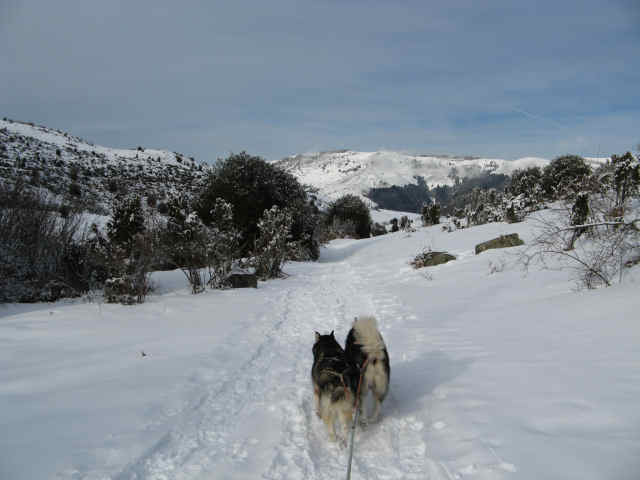 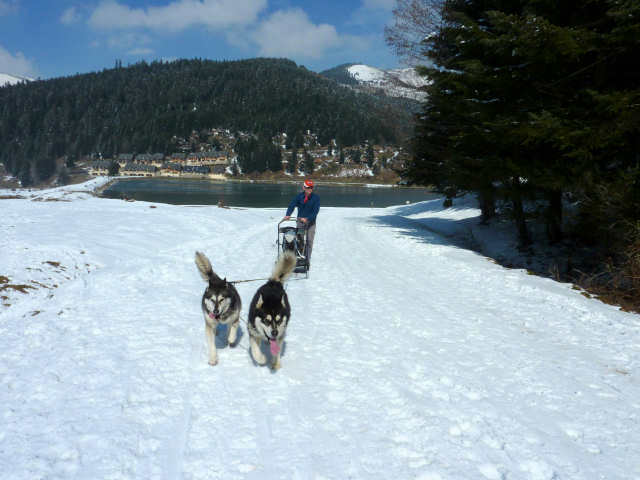 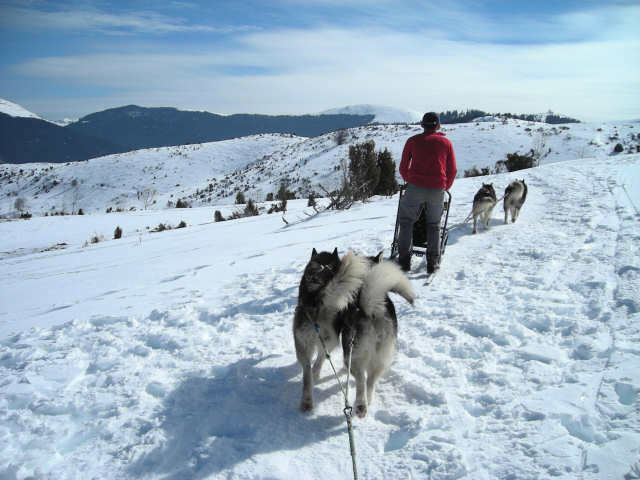 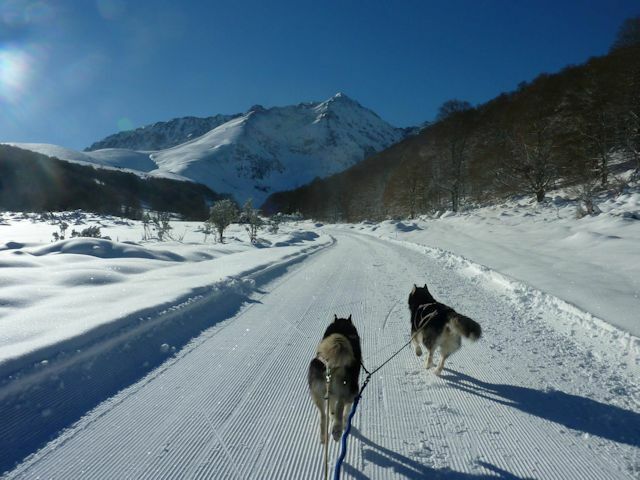 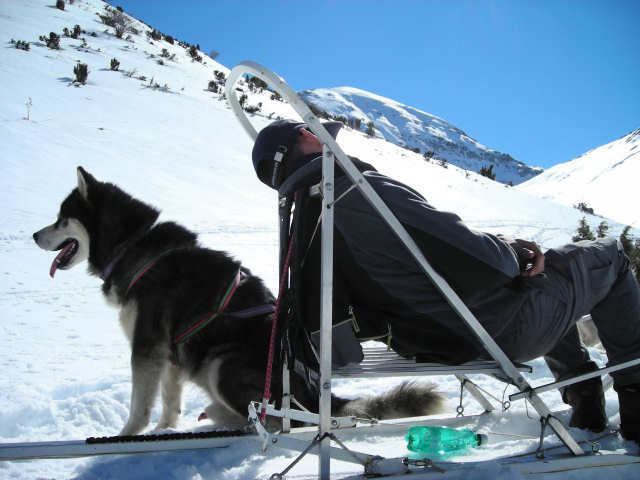 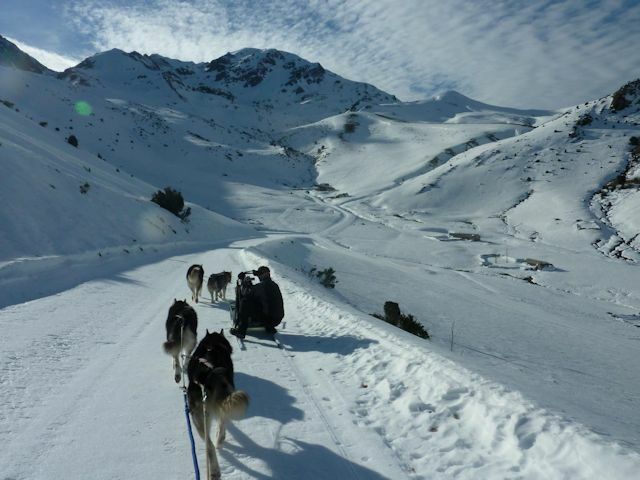 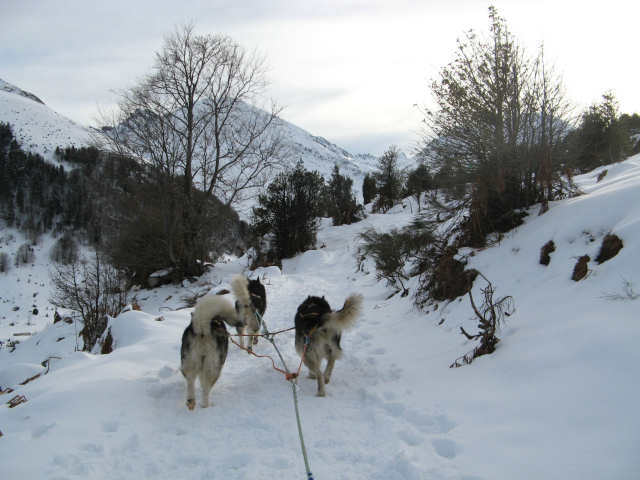 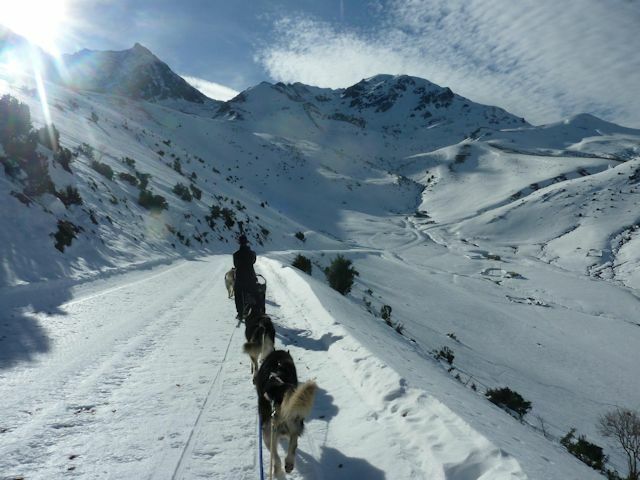 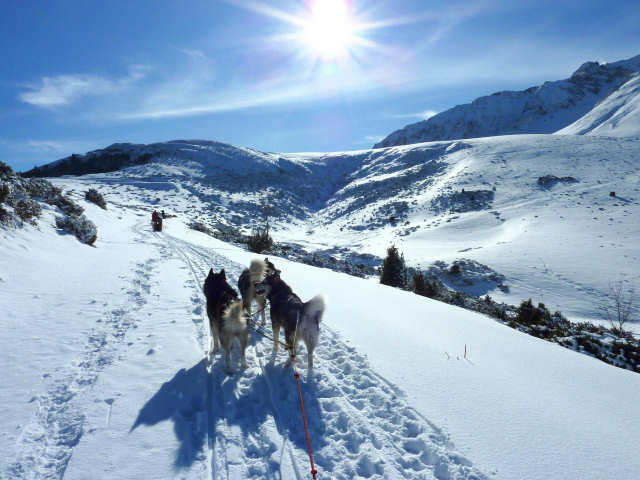 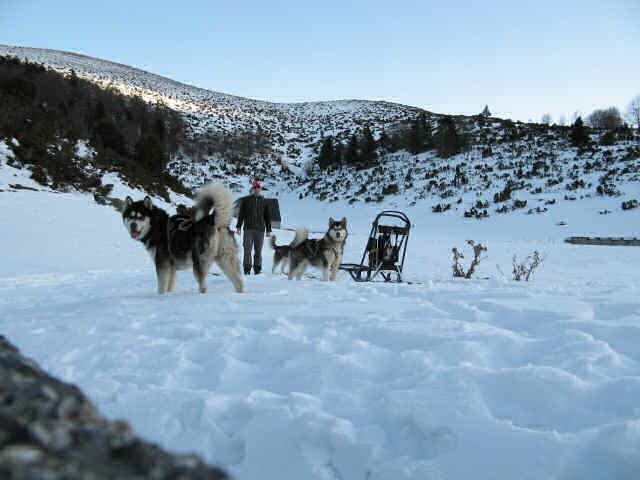 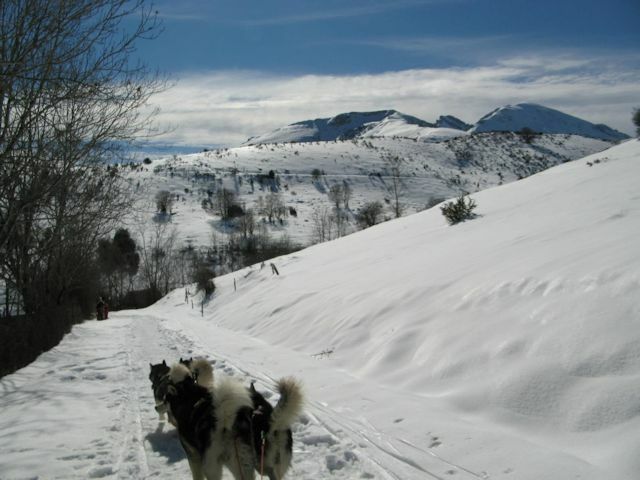 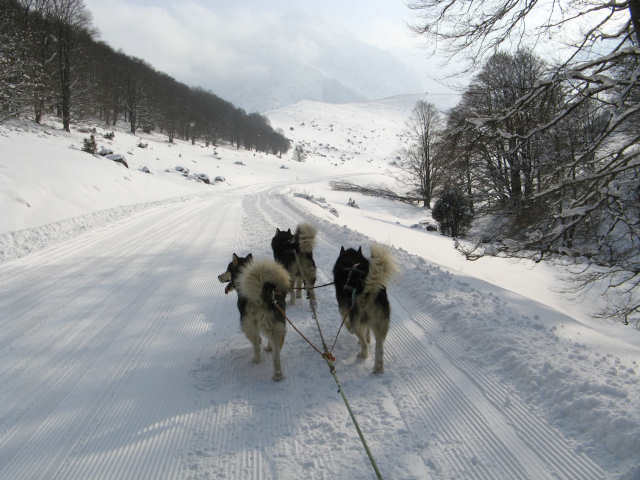 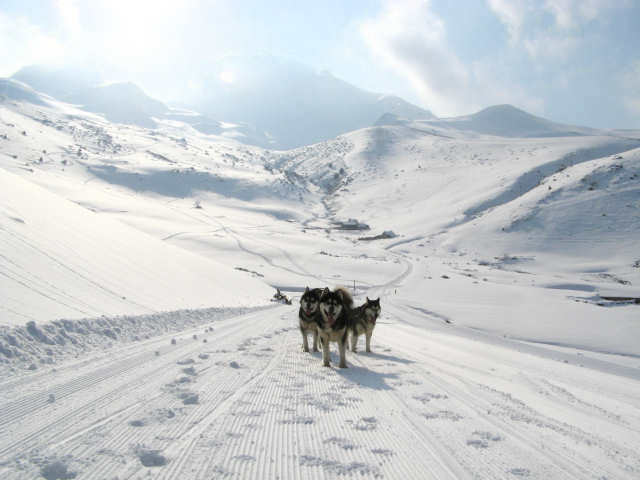 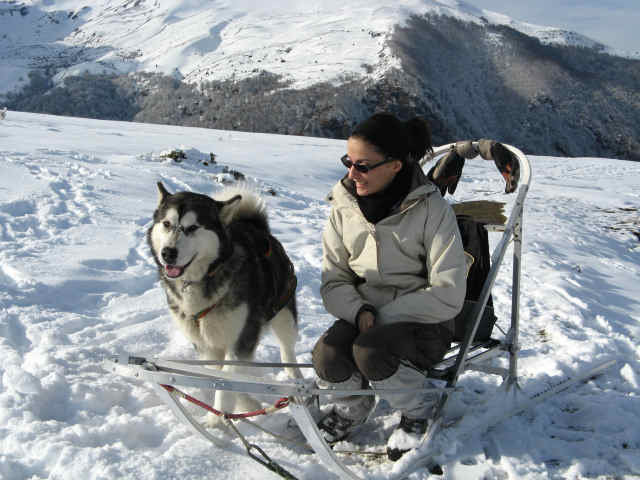 It's difficult to make sledding in the High Pyrenees, because the mentality of those responsible for the ski resorts is lagging behind that of those responsible for stations in the Alps. 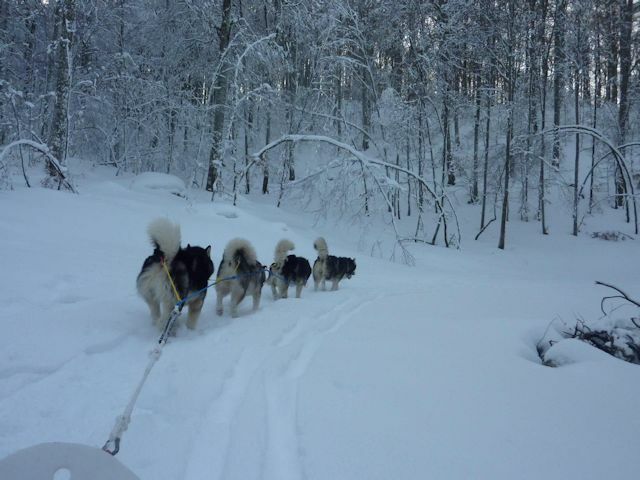 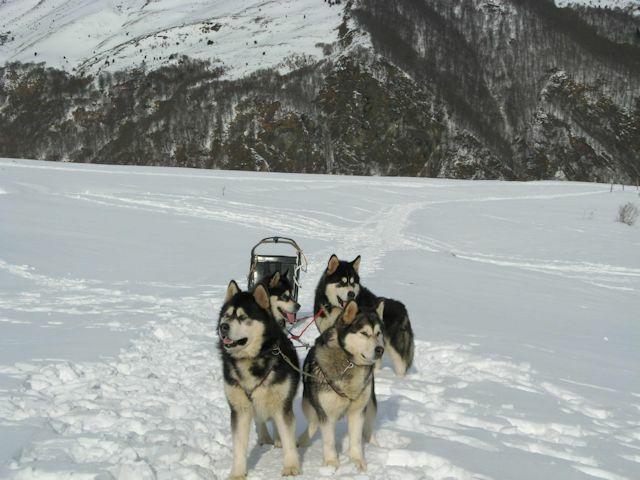 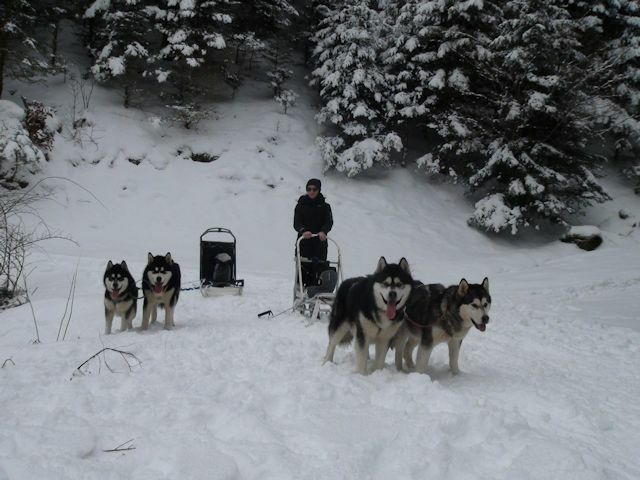 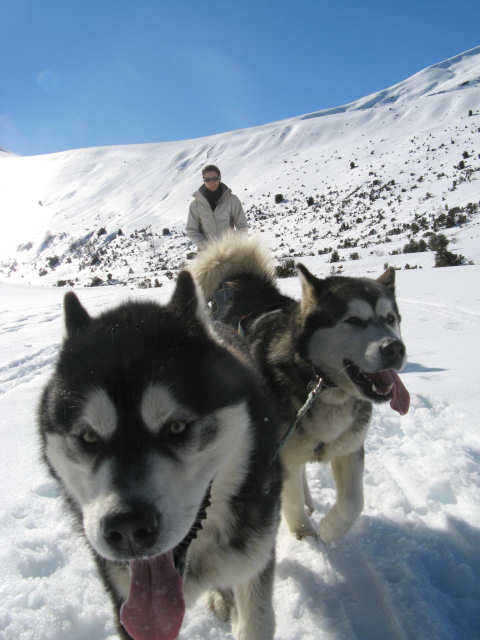 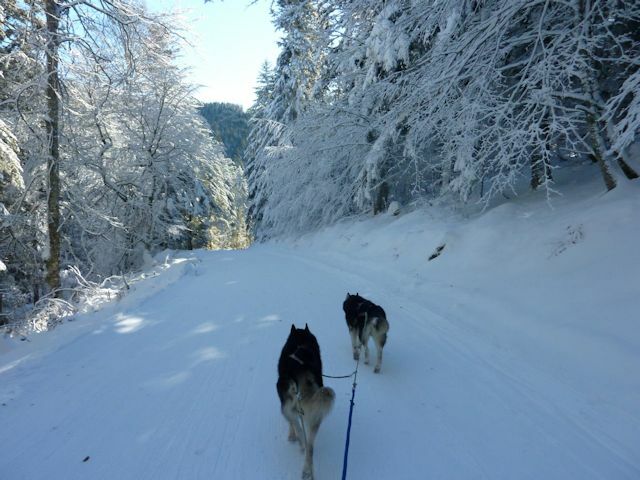 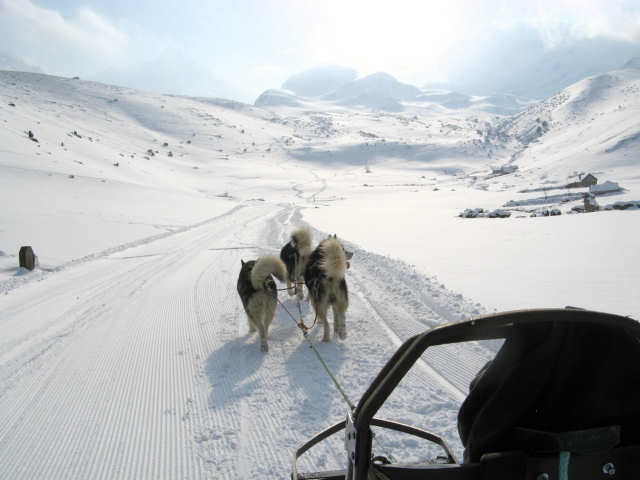 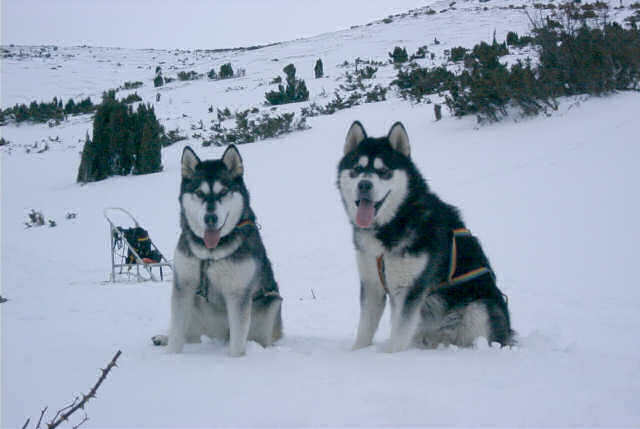 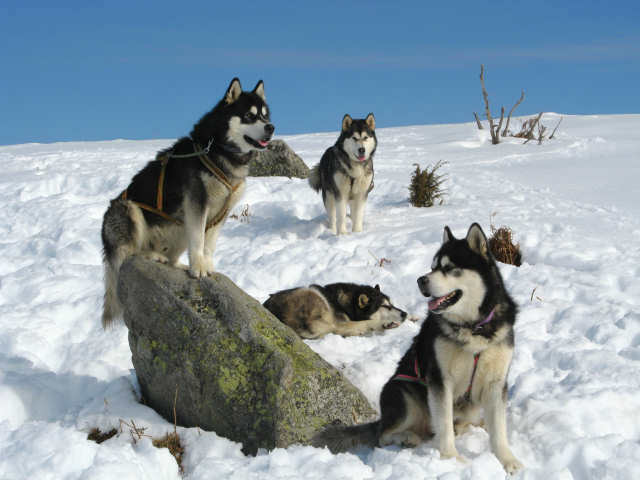 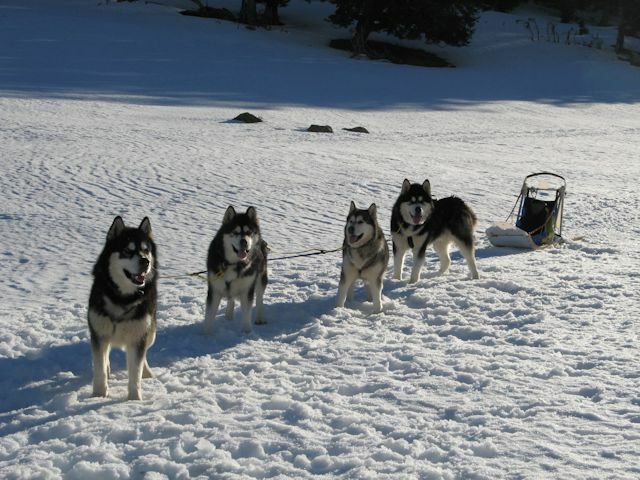 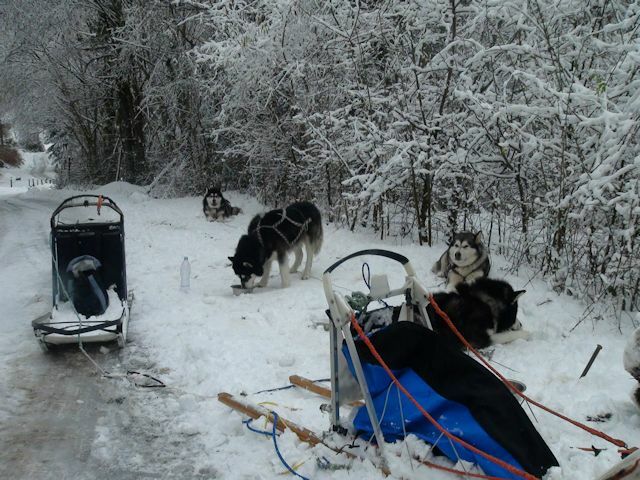 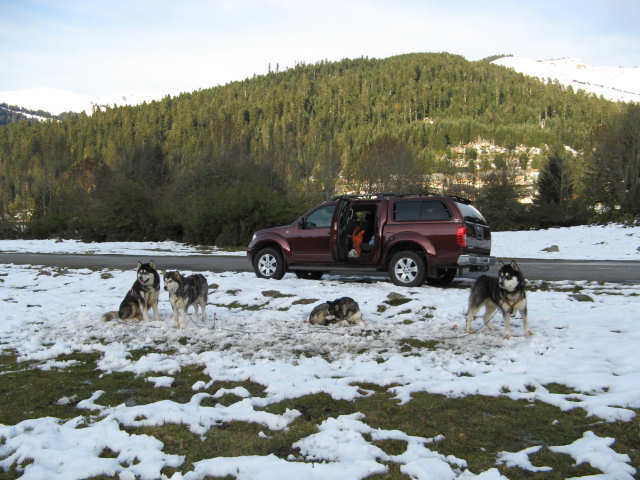 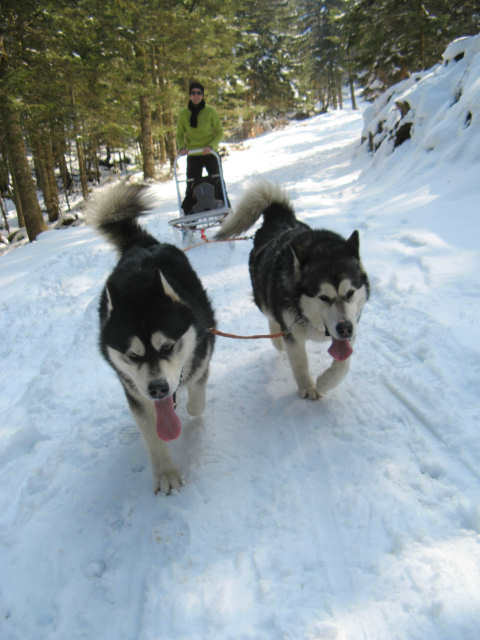 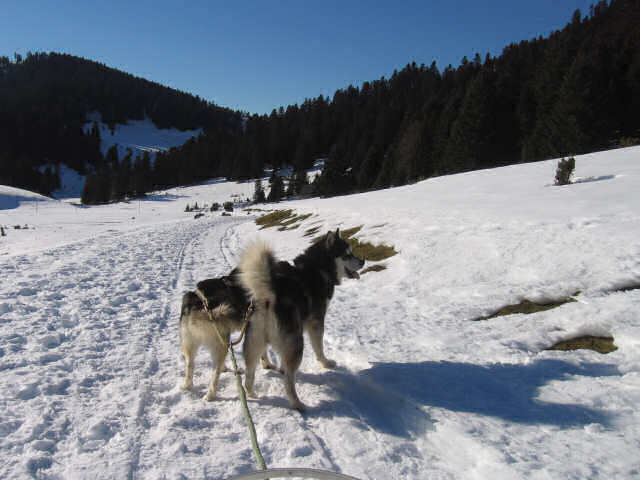 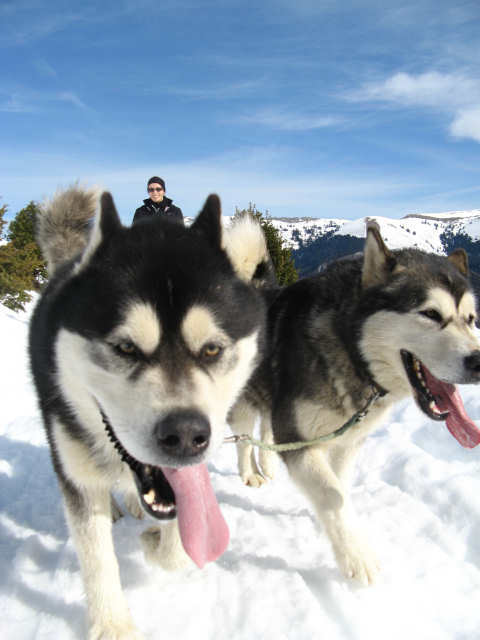 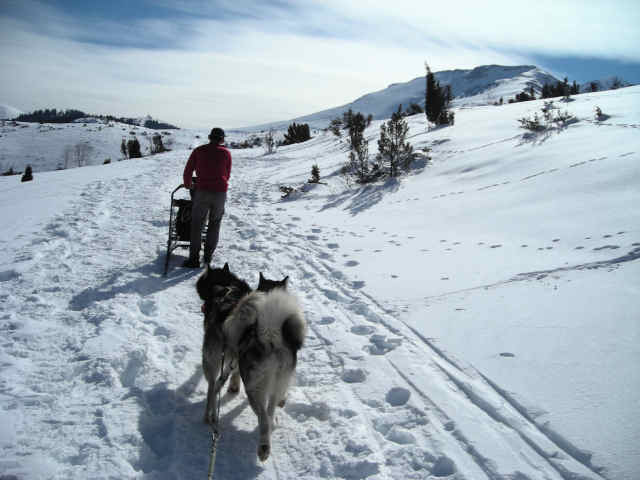 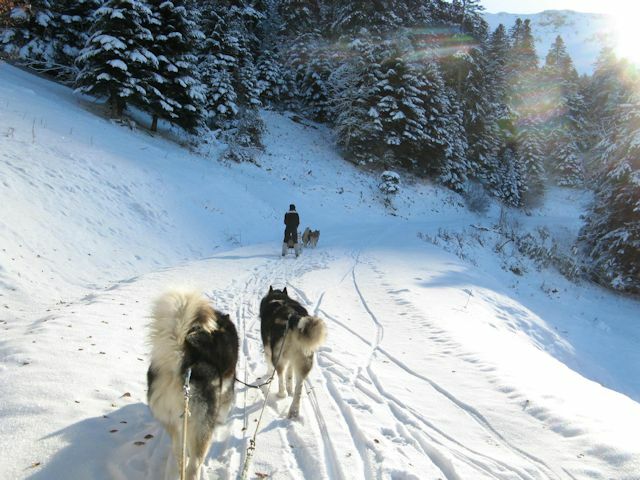 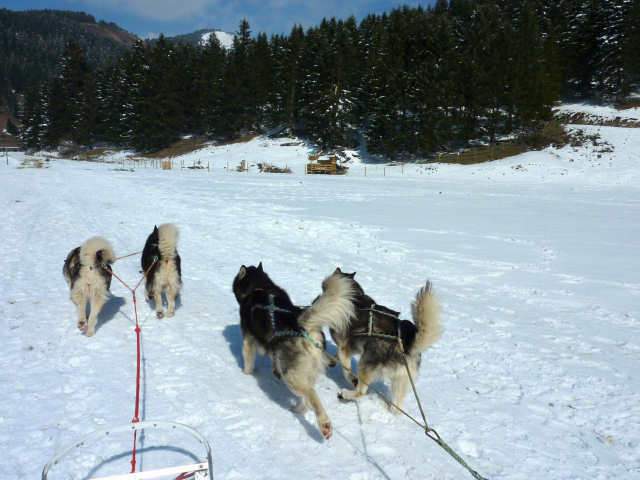 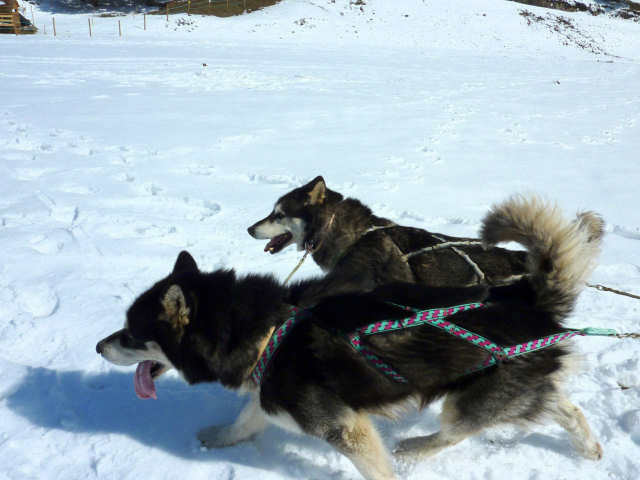 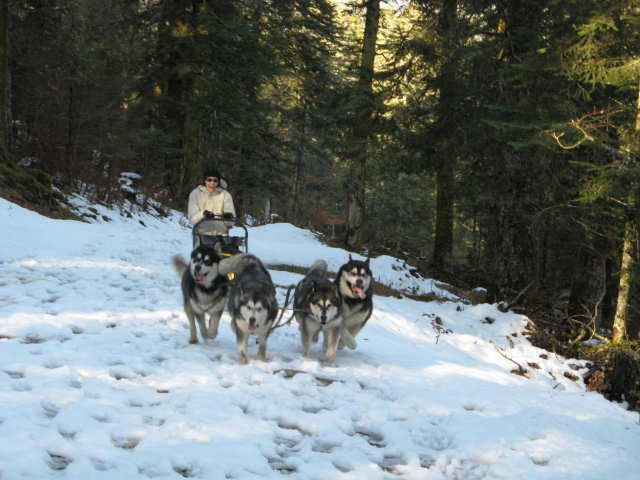 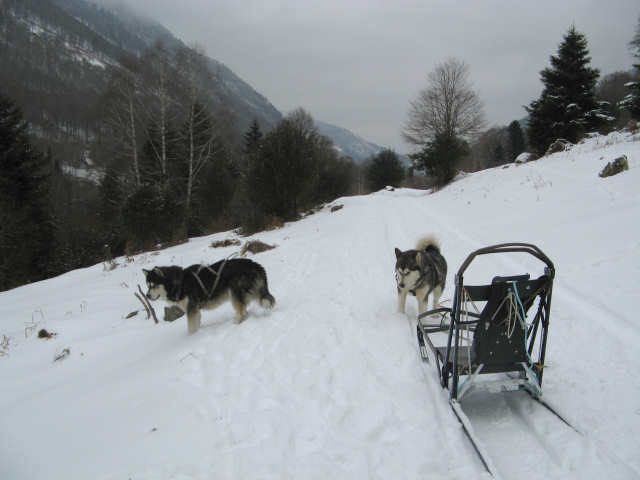 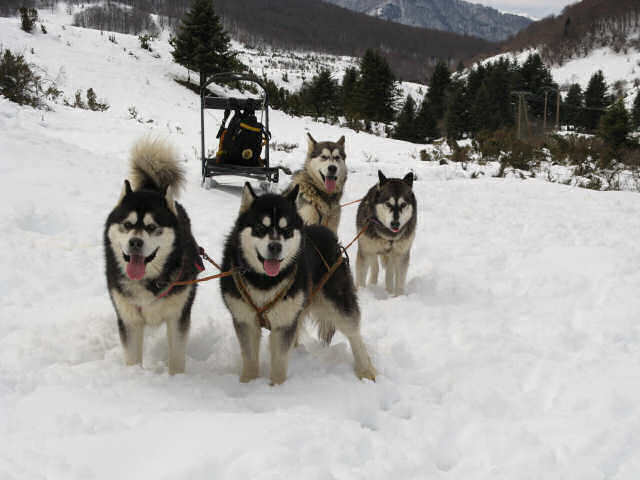 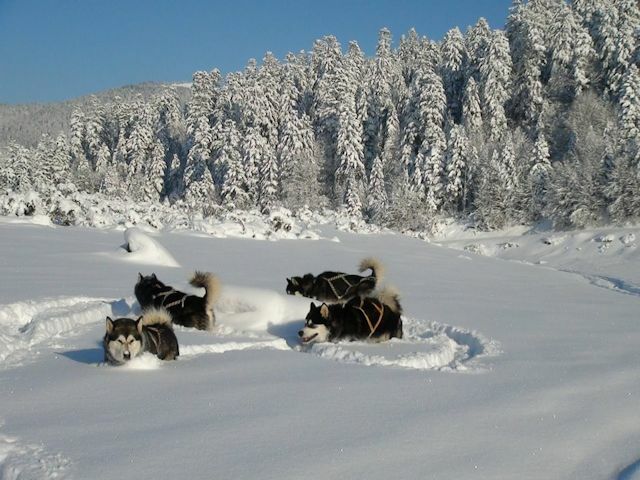 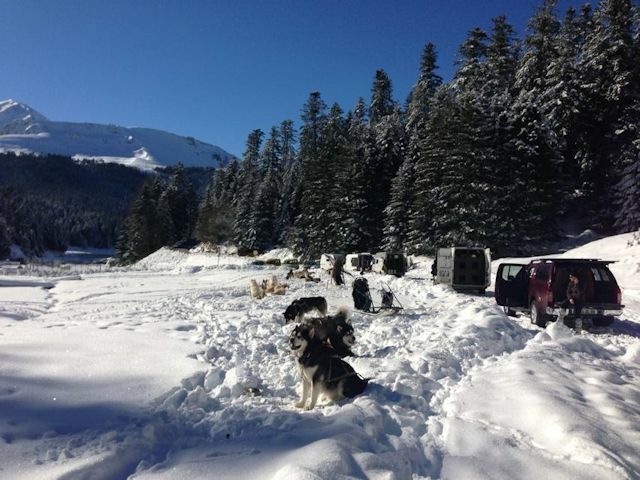 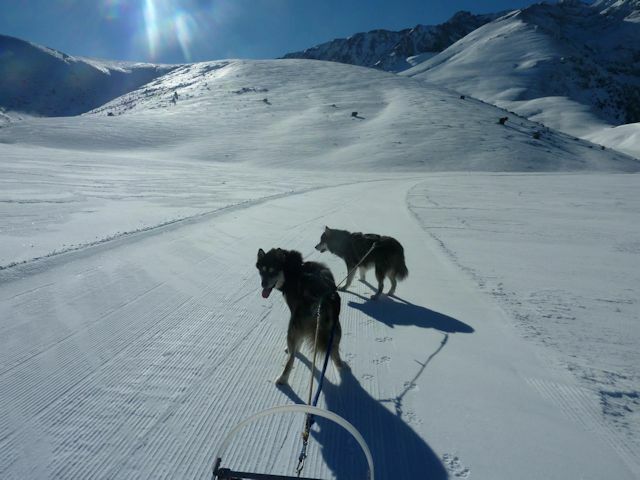 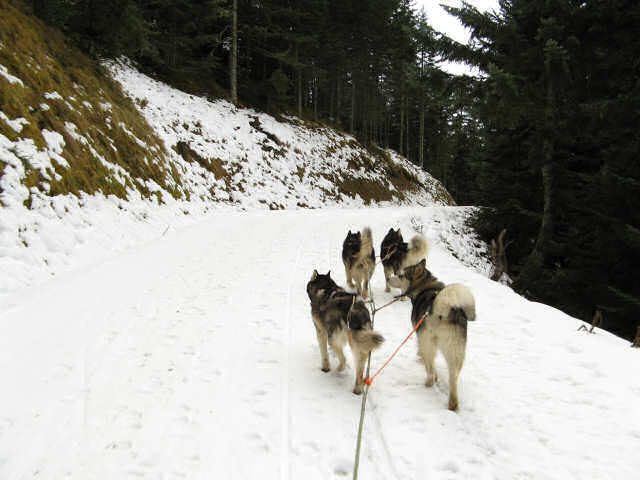 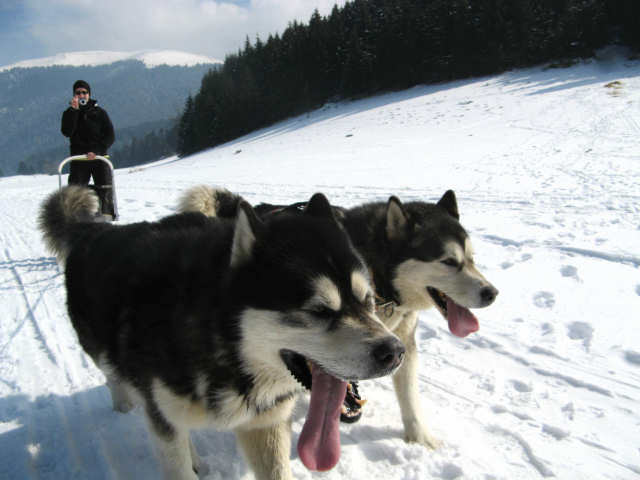 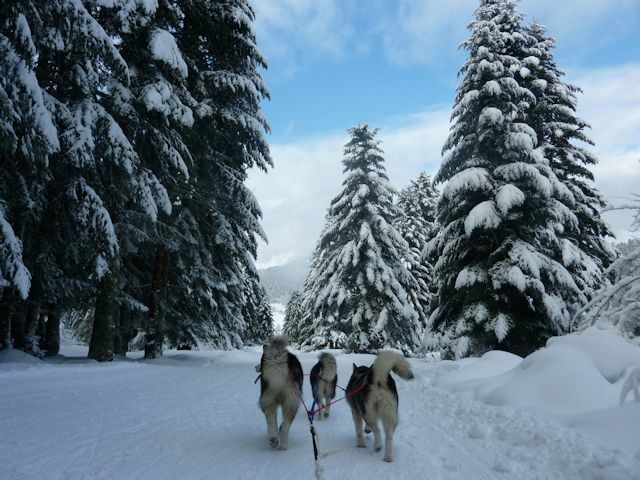 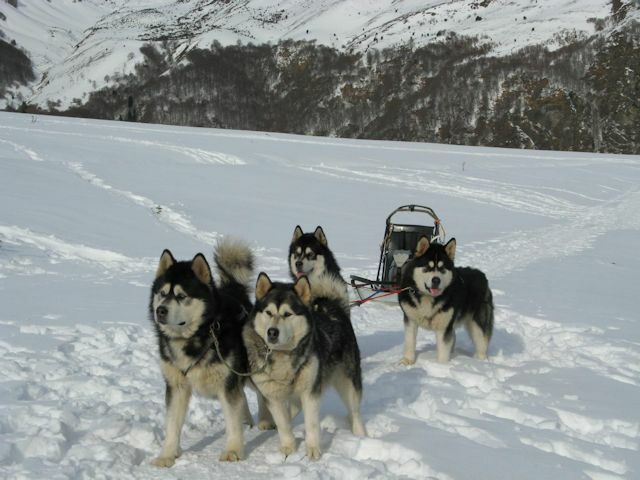 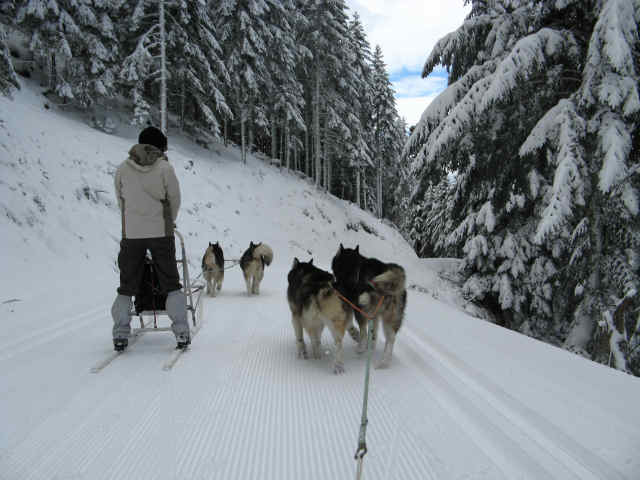 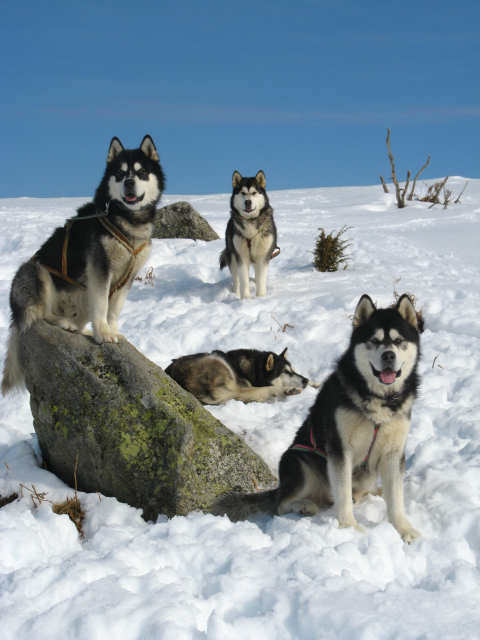 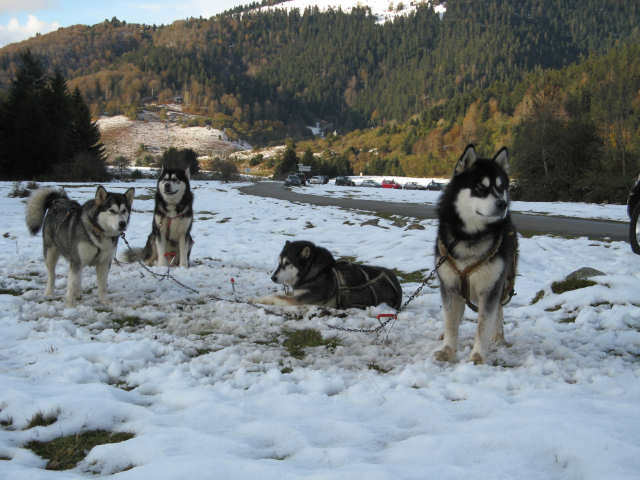 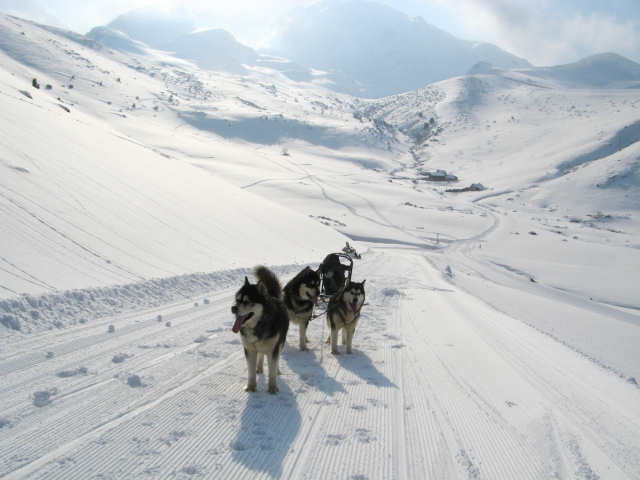 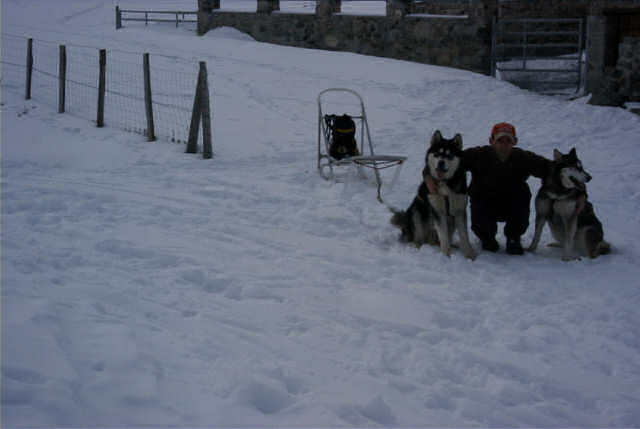 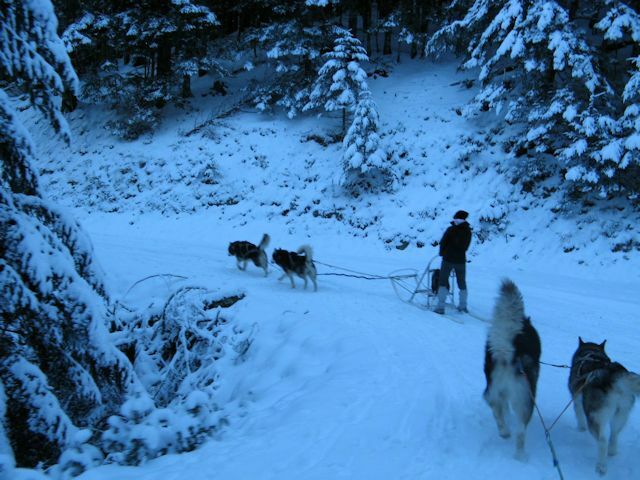 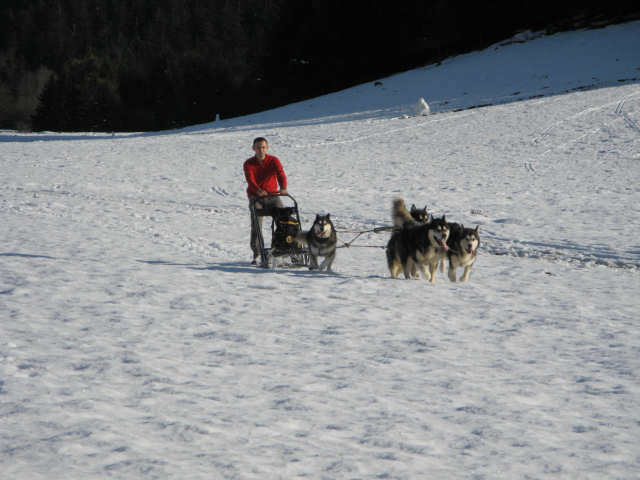 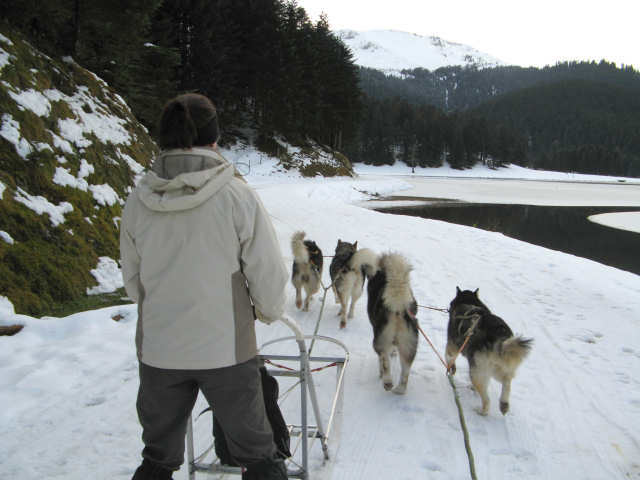 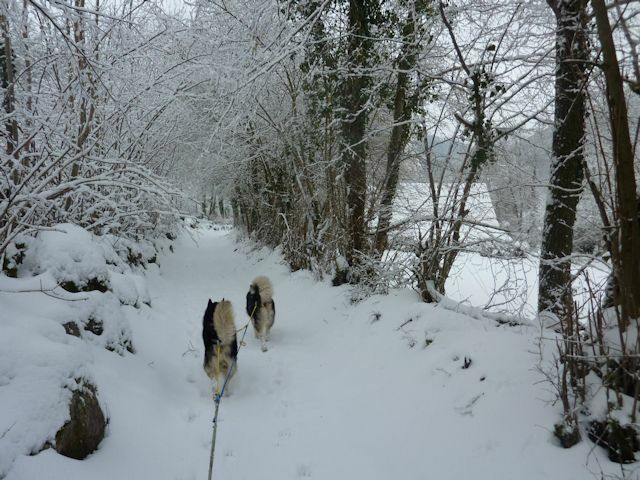 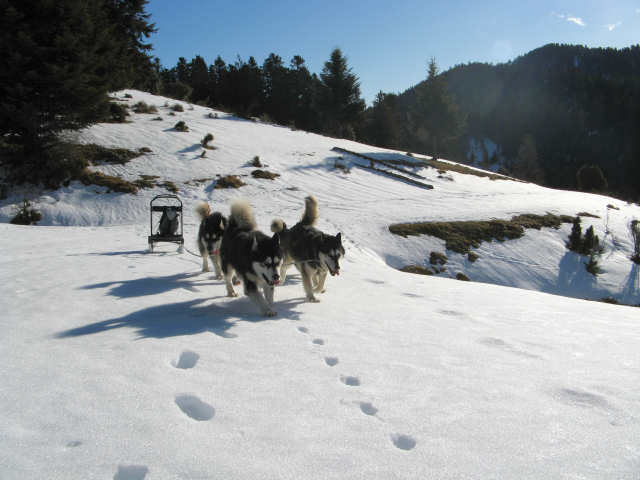 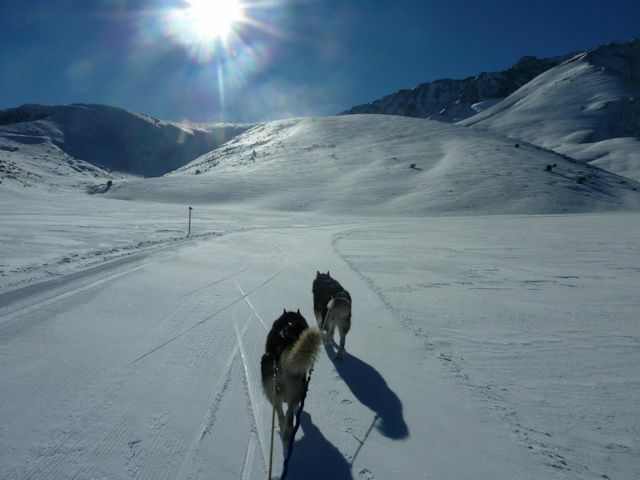 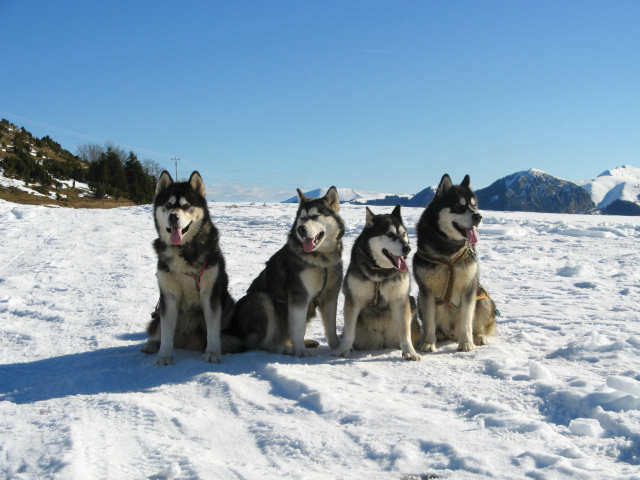 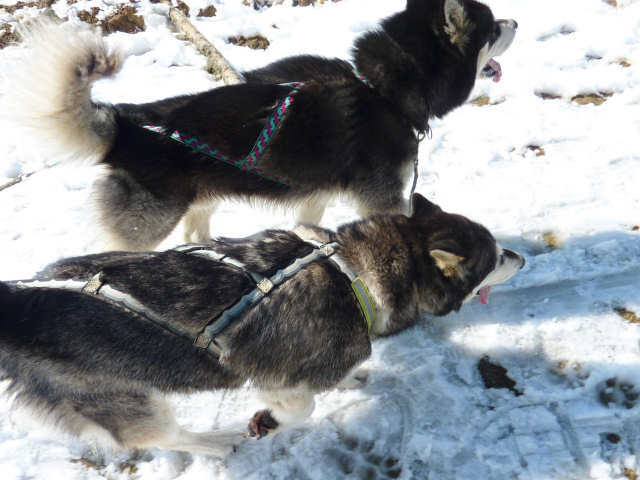 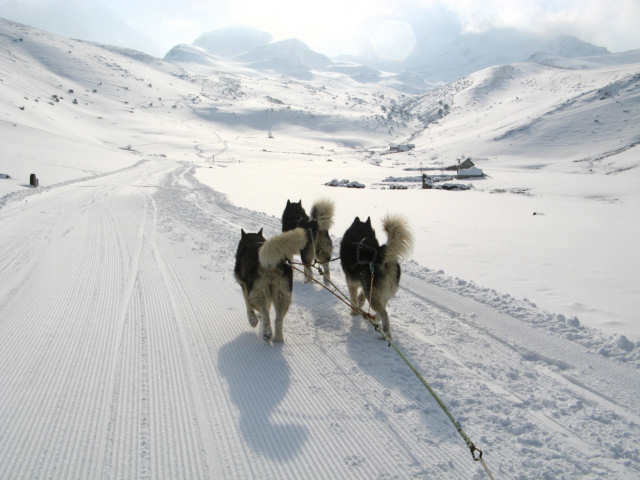 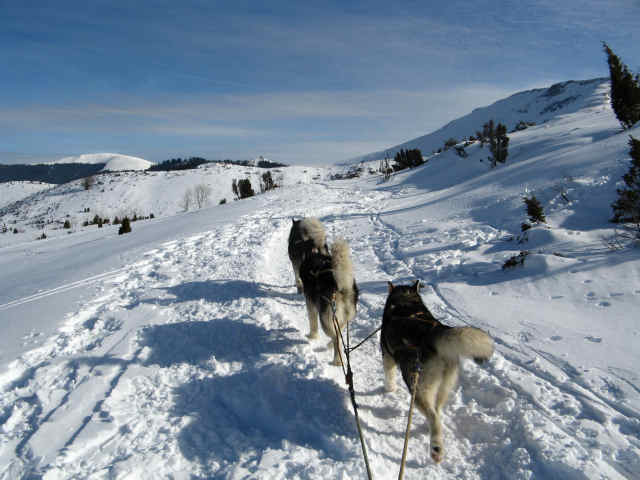 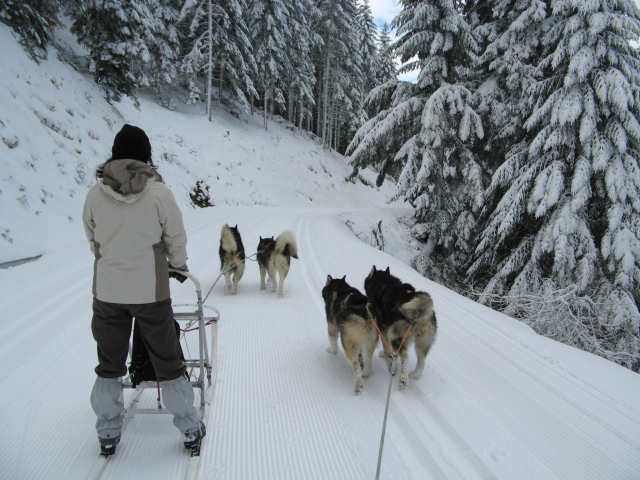 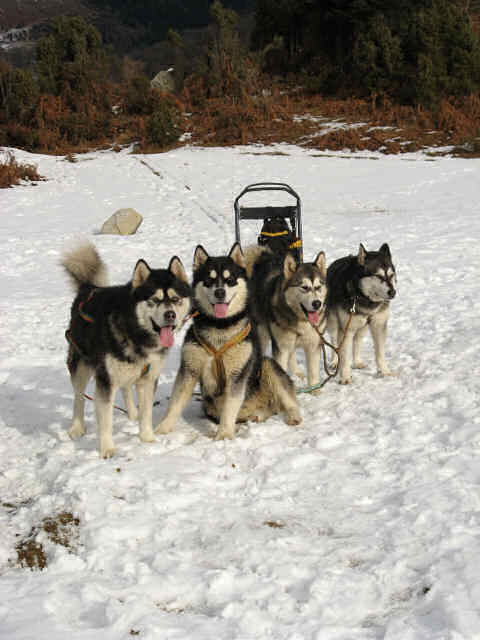 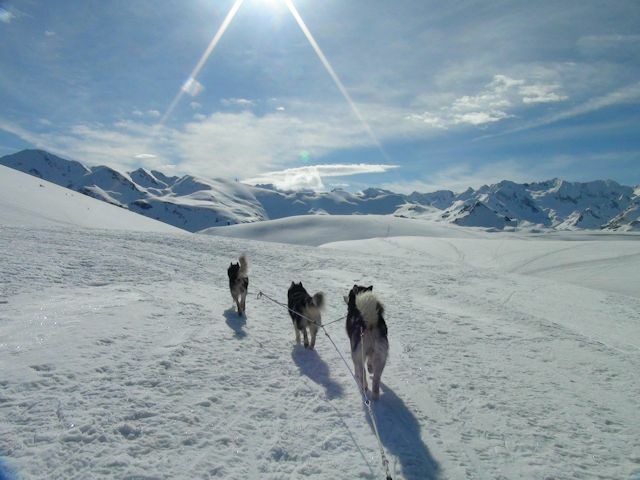 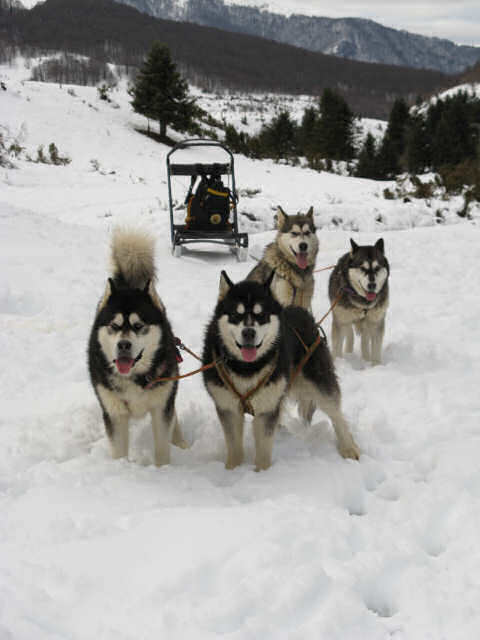 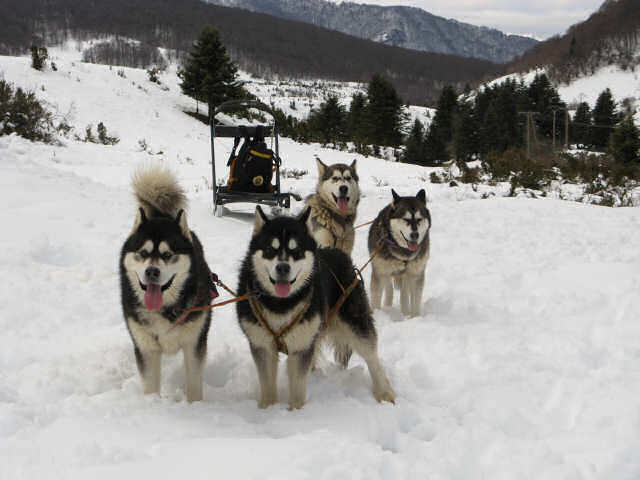 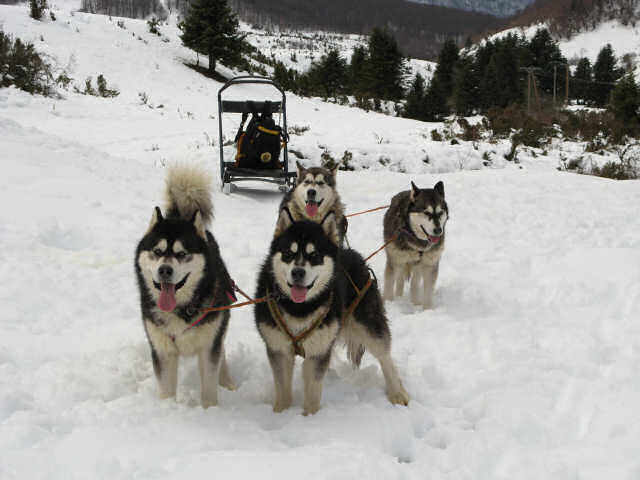 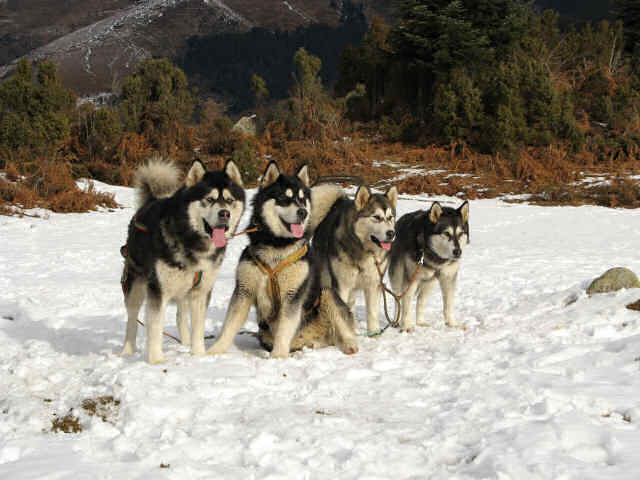 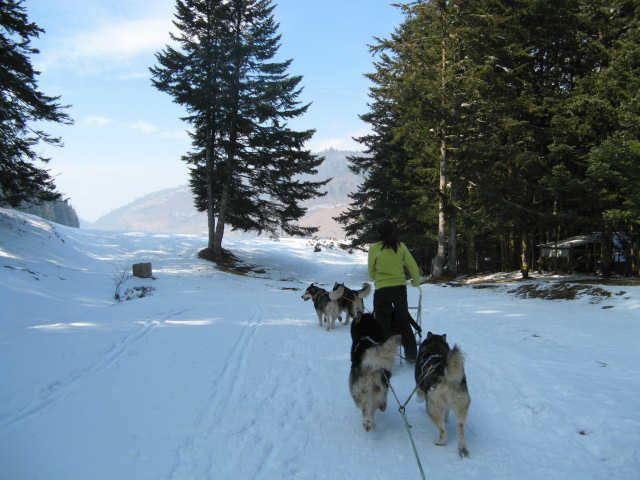 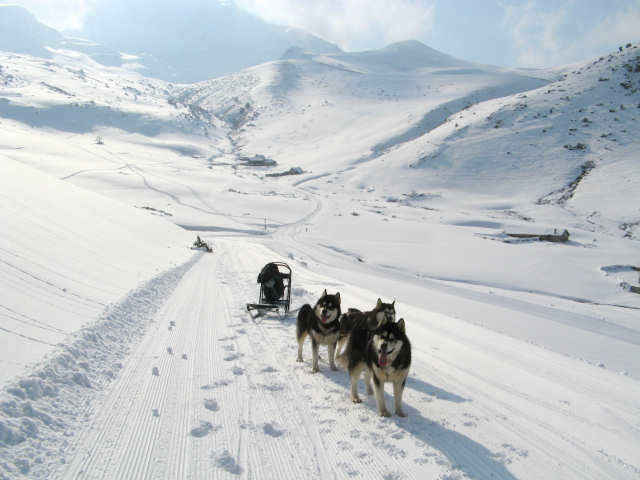 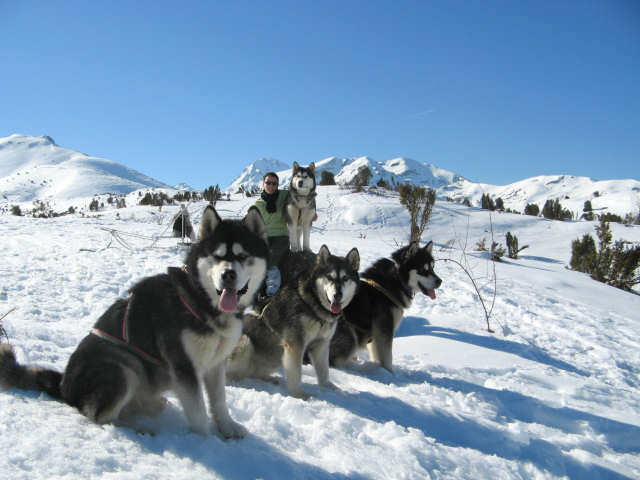 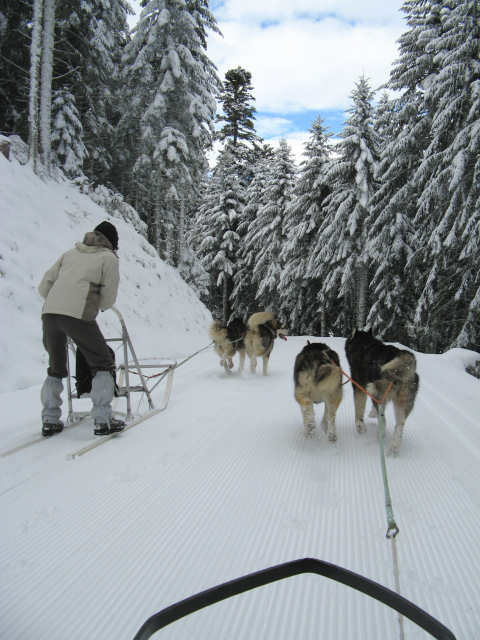 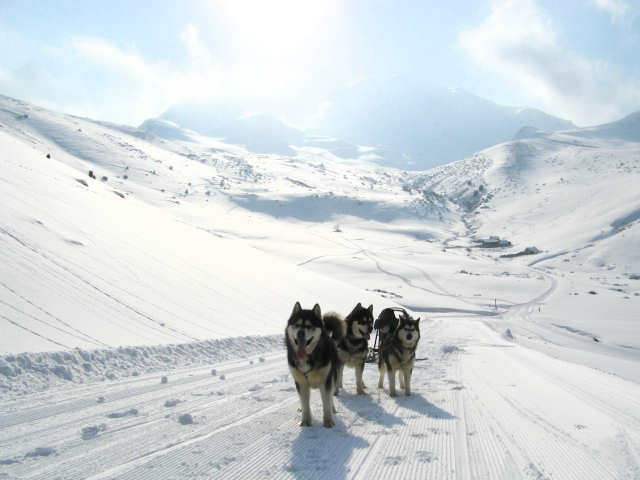 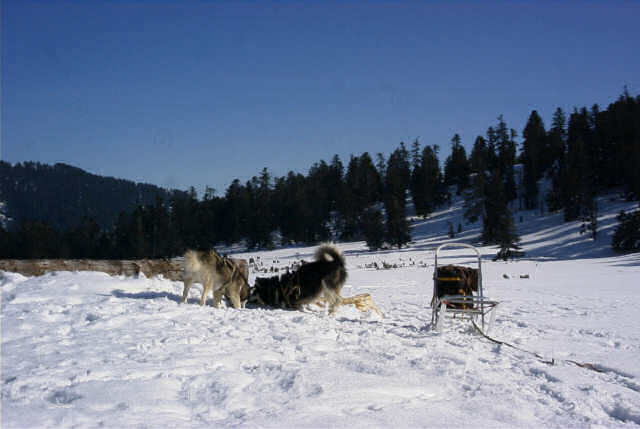 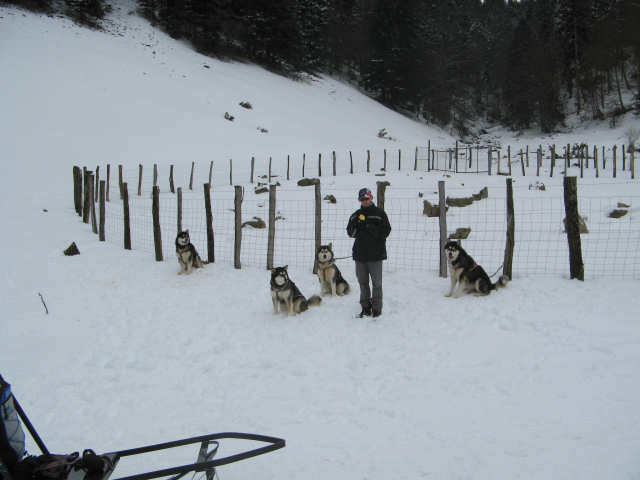 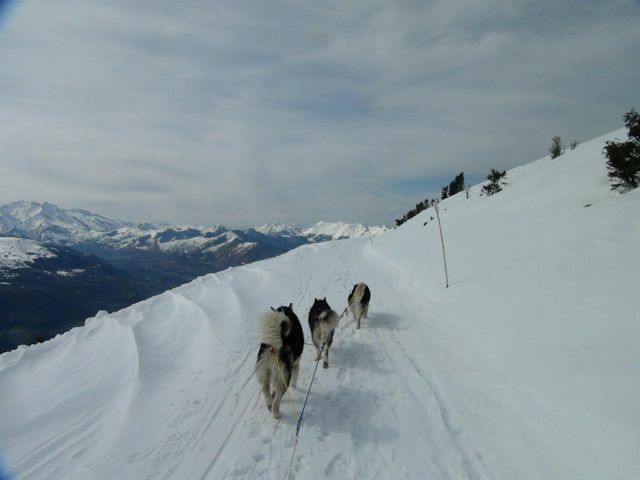 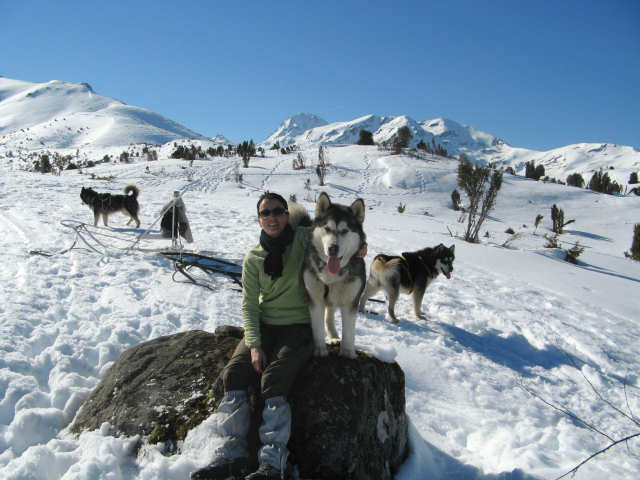 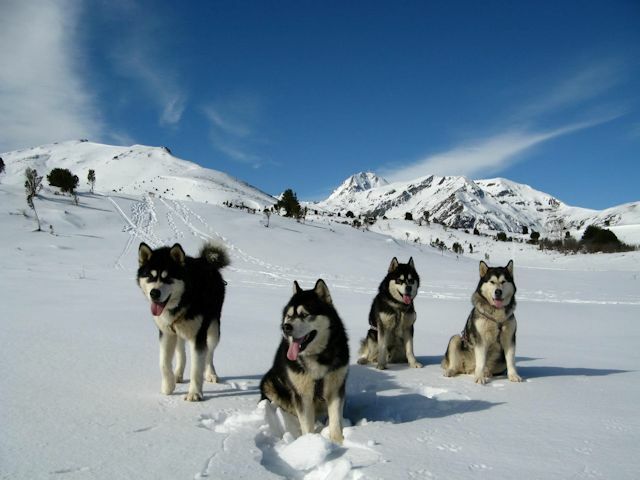 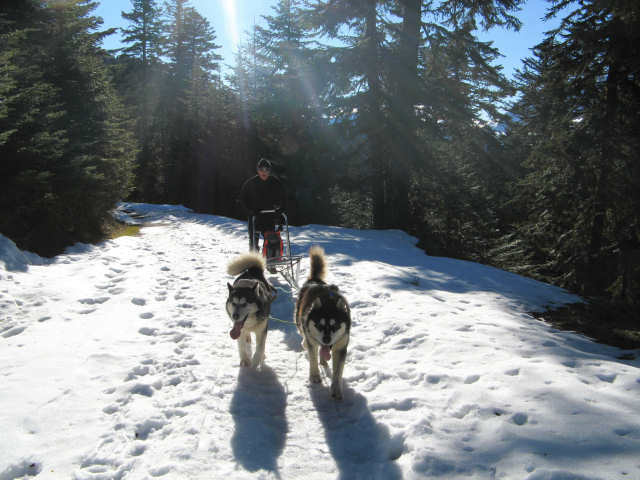 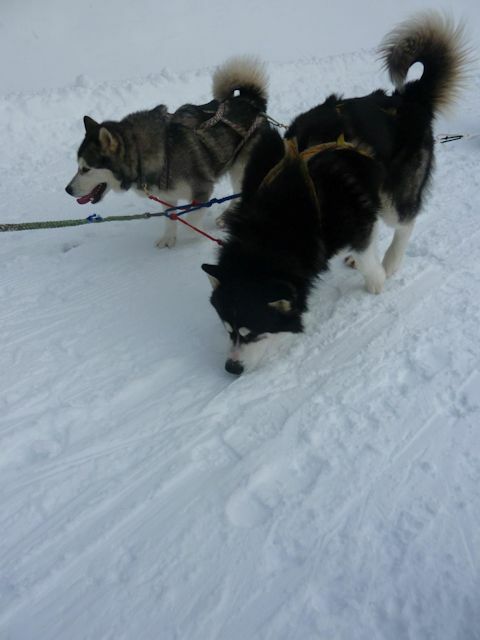 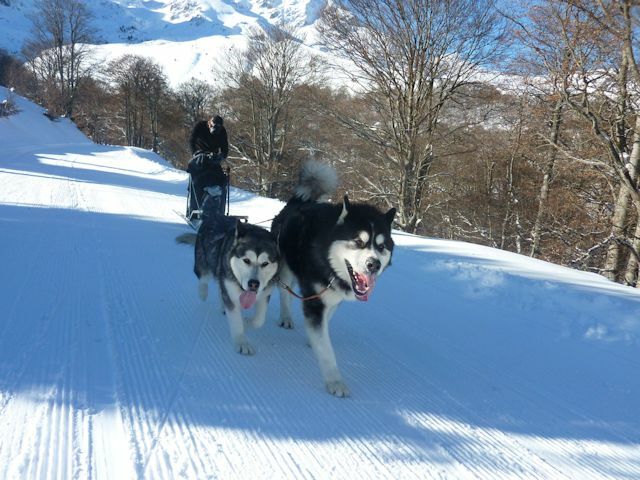 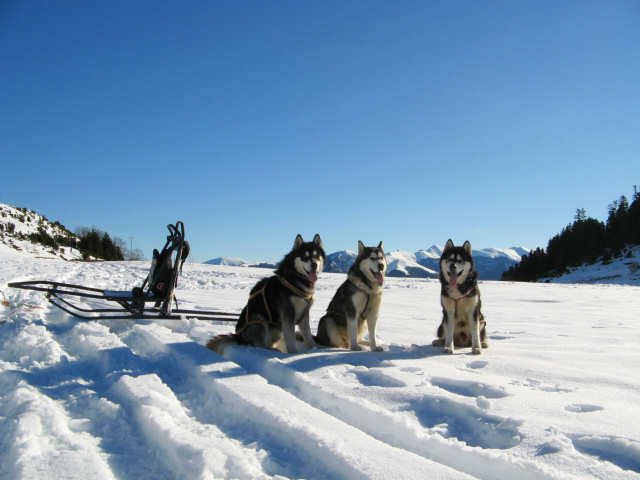 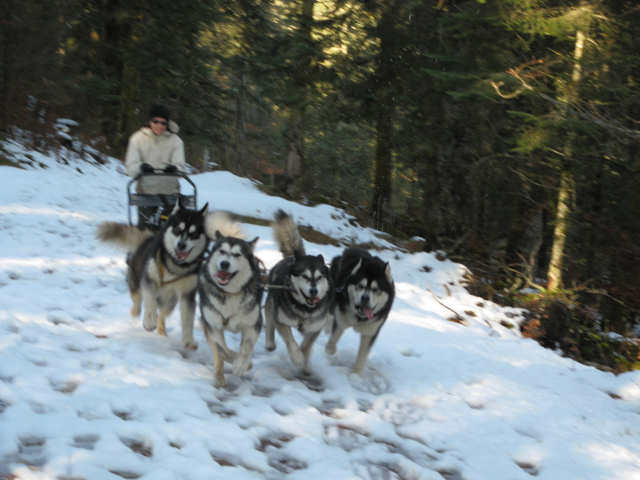 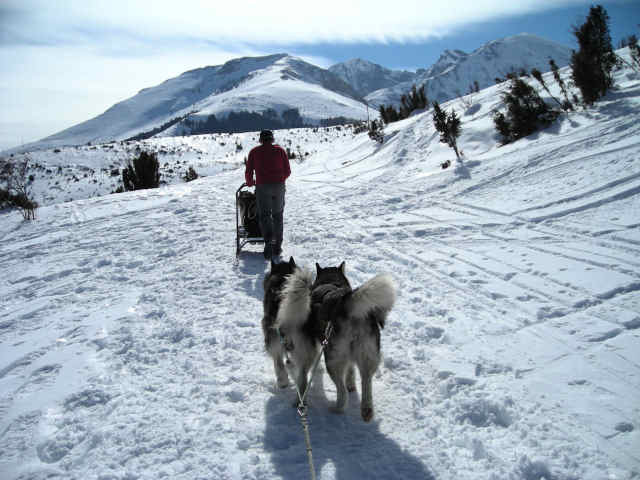 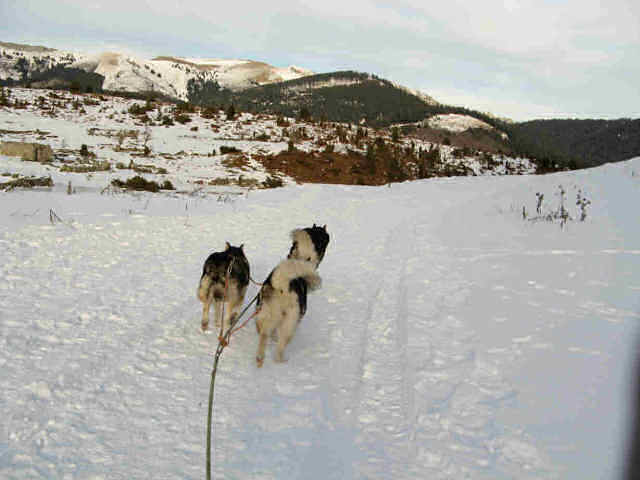 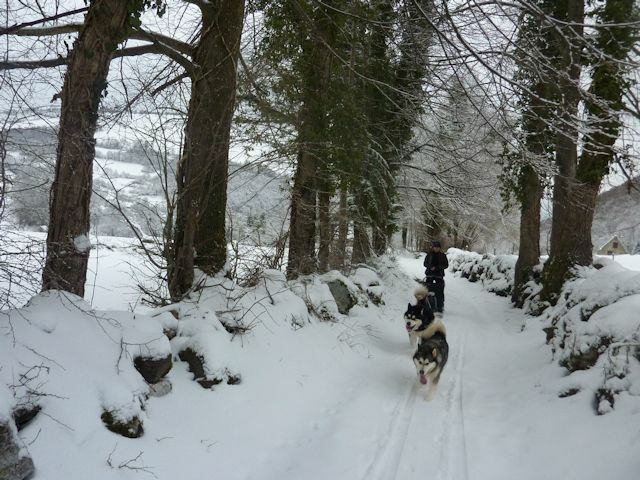 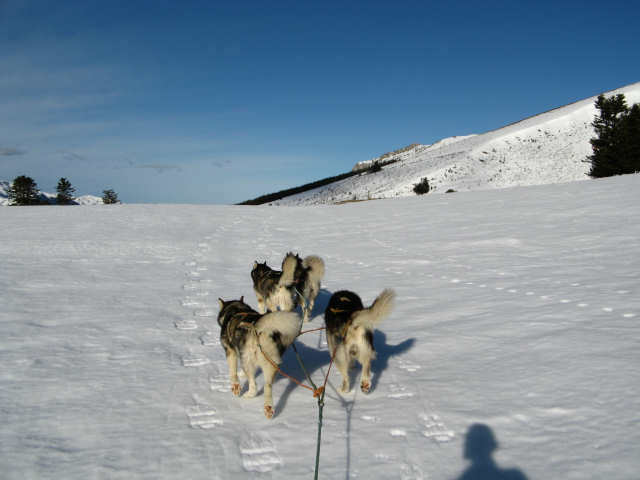 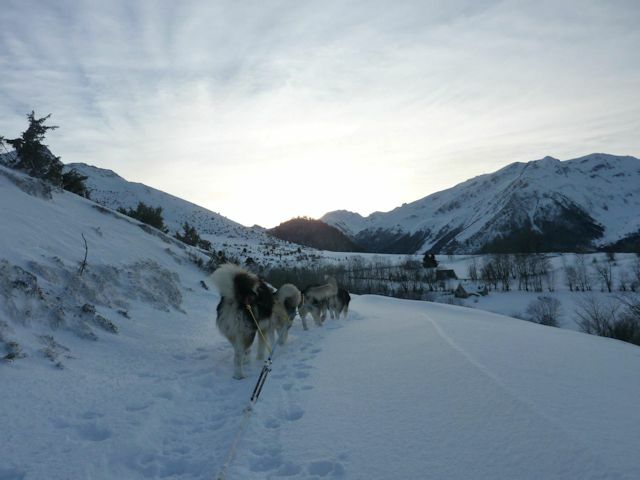 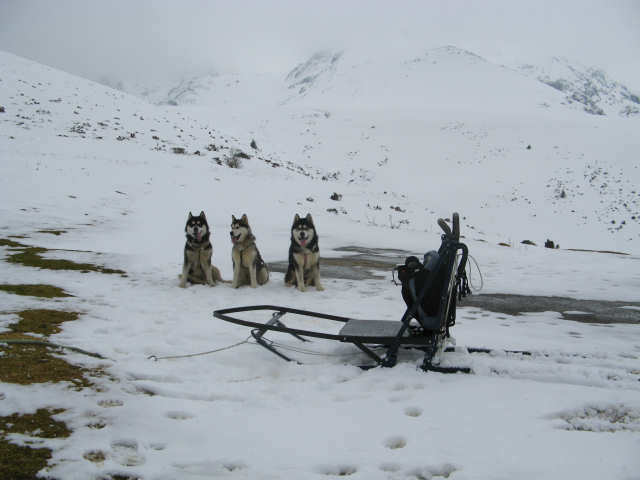 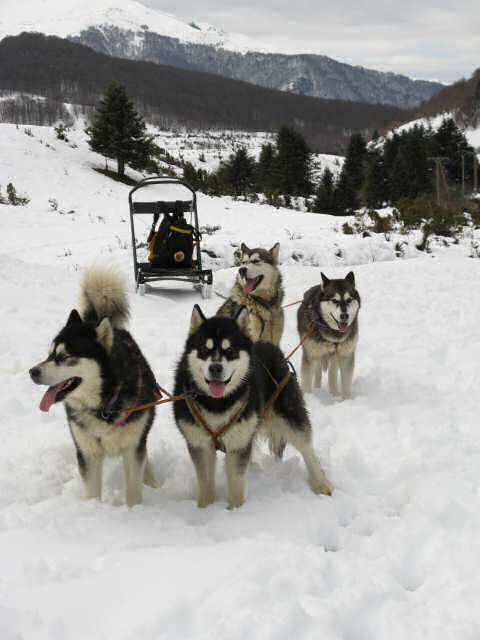 Basically, they do not want a dog sled on the pisted down trails, they want to reserve them for cross-country skiers. 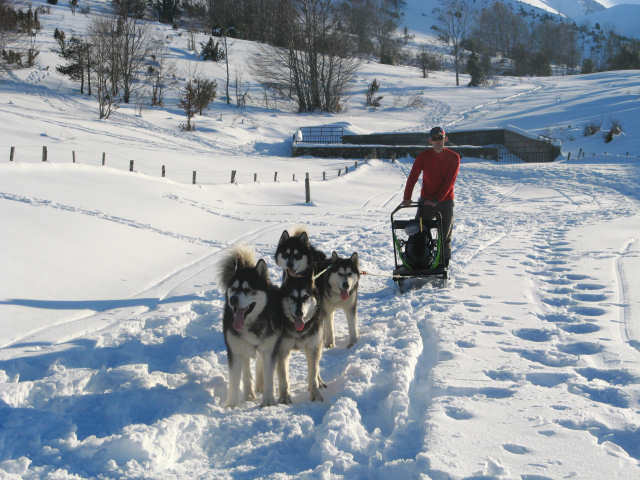 However, the station "Payolle" still pack down some tracks when they do not make paying the tracks, thus we can make sledding. 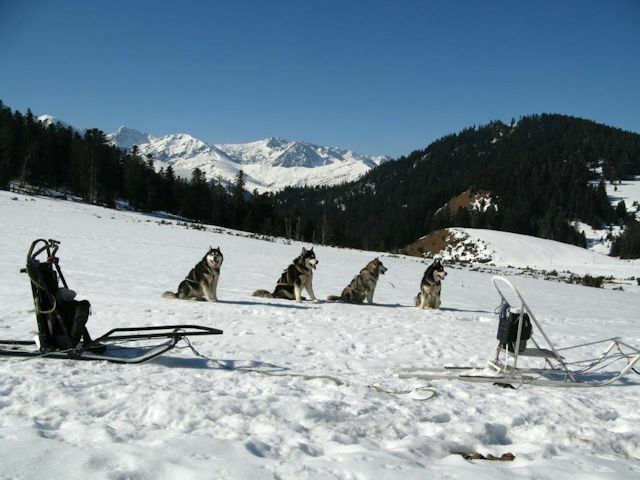 And in these cases, the coexistence of cross-country skiers and sledges is going very well. 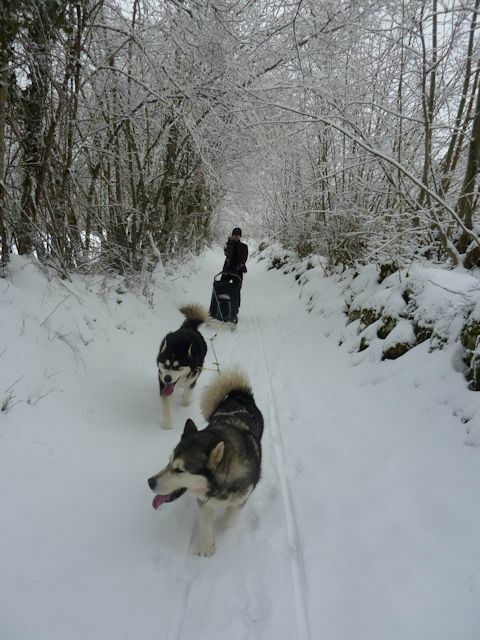 a journey, beautiful, at the entrance to Payolle, off-track. 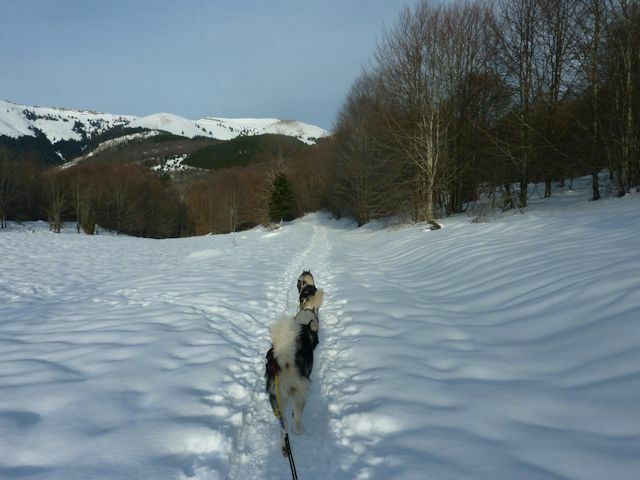 a journey, somewhat steep, between the Col d'Aspin and Col de Beyrede, off-track. 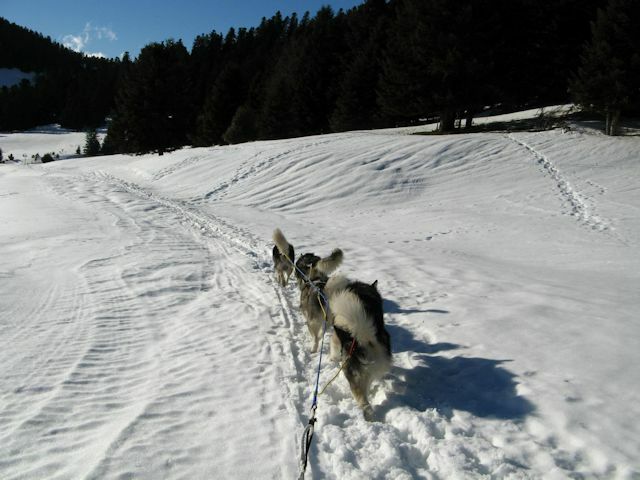 an off-piste course, feasible only with a lot of snow. 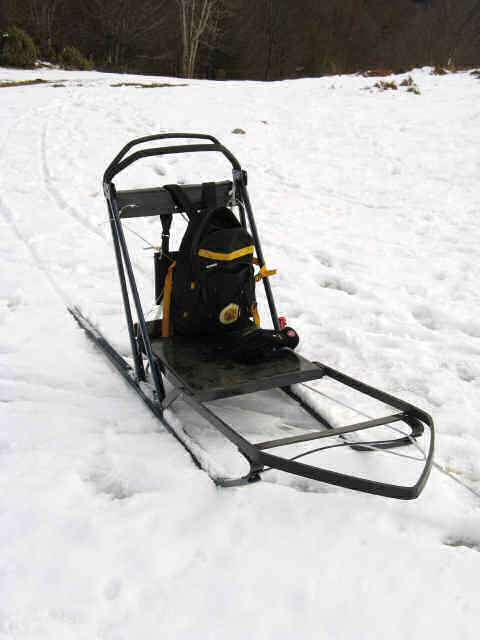 My beginnings with sledding were made with an artisanal sled, manufactured by my father. 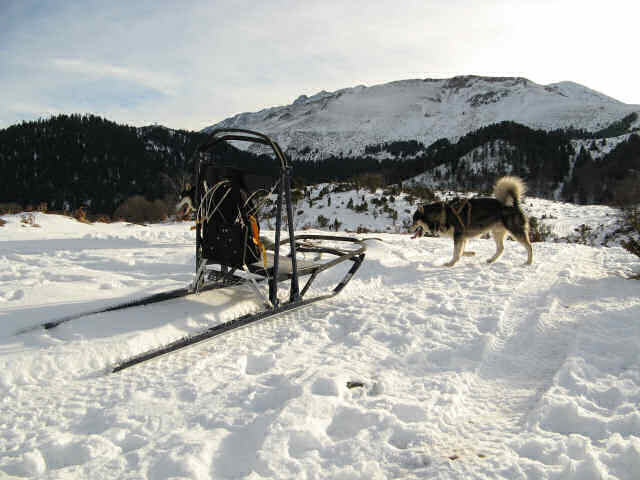 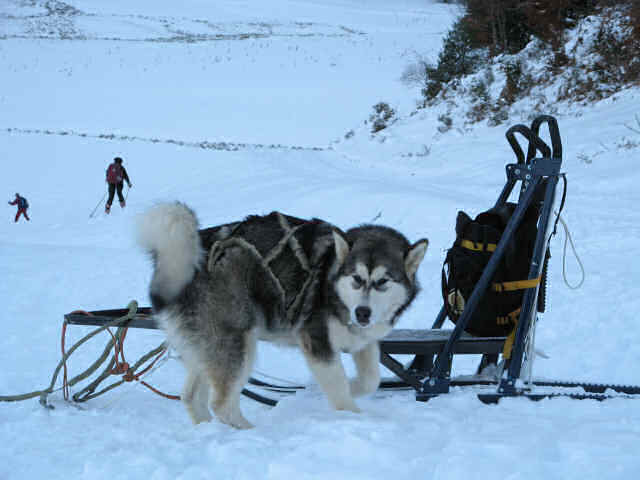 With fiberglass runners and aluminum frame,it was a little too big sled, but it worked very well anyway. 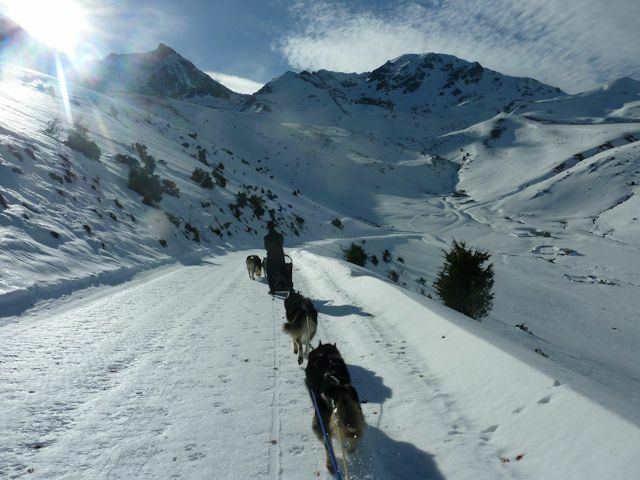 Going down the Sarrat de Gaye arround "Payolle", Pyrénées, France. 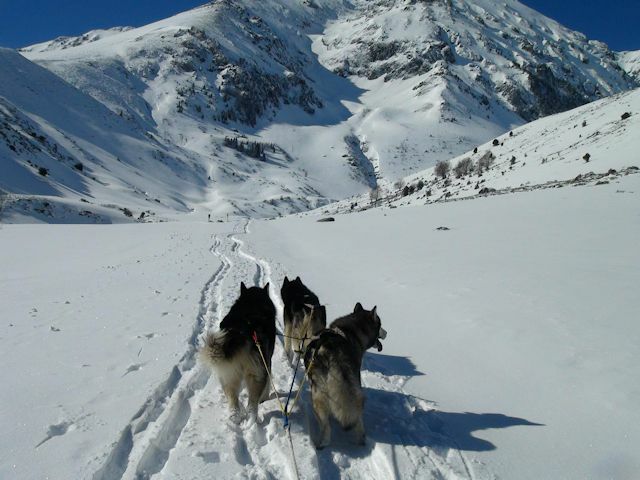 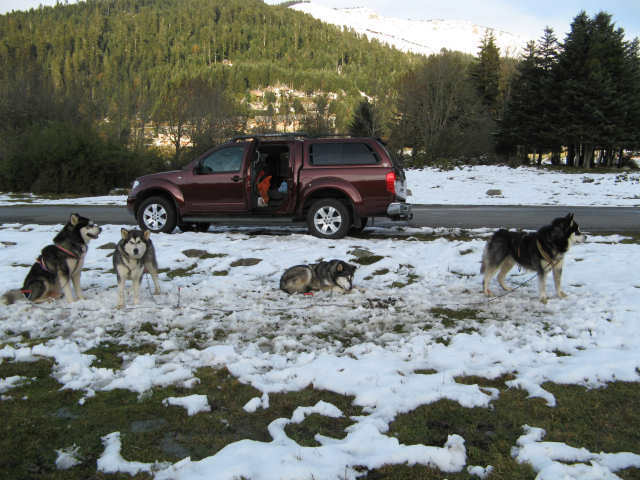 First trip with 4 dogs : Urok, Cazan, Oxane et Coleen on the plateau of "Payolle", Pyrénées, France. 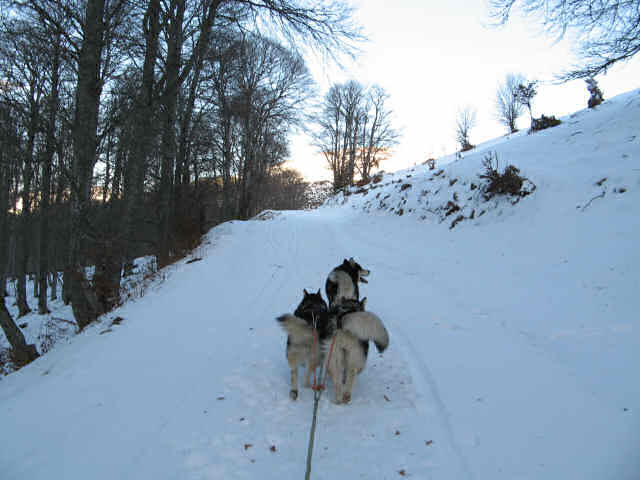 On the road of Hourquette Ancizan pass, under trees . 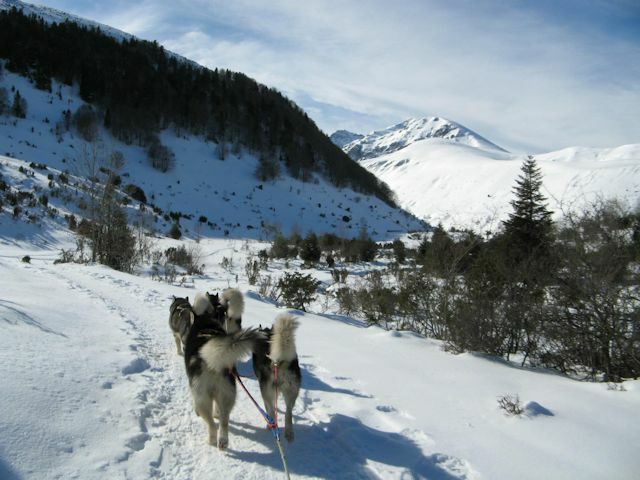 On the road of Hourquette Ancizan pass, once arrived on the plateau of the horses. 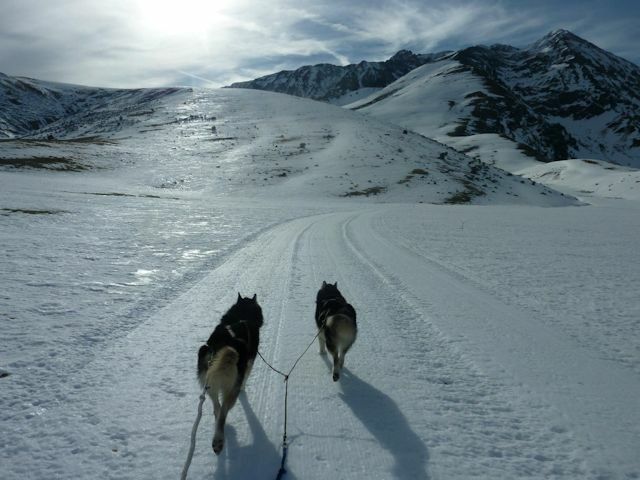 By exploring a new path ... that goes nowhere !!! 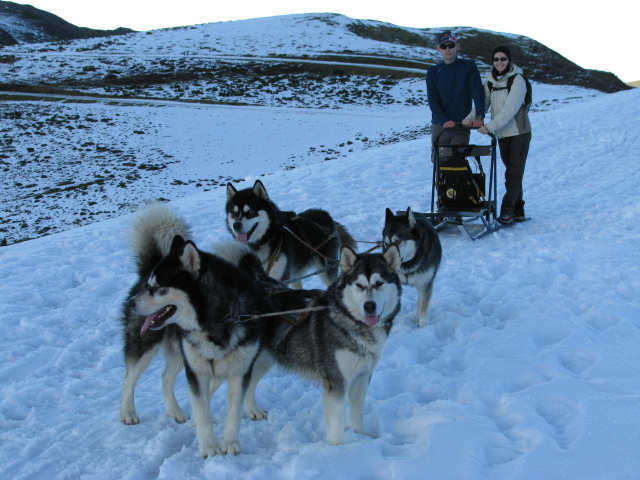 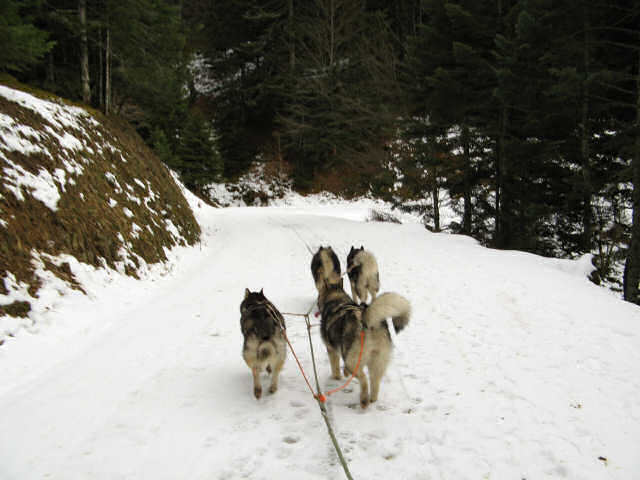 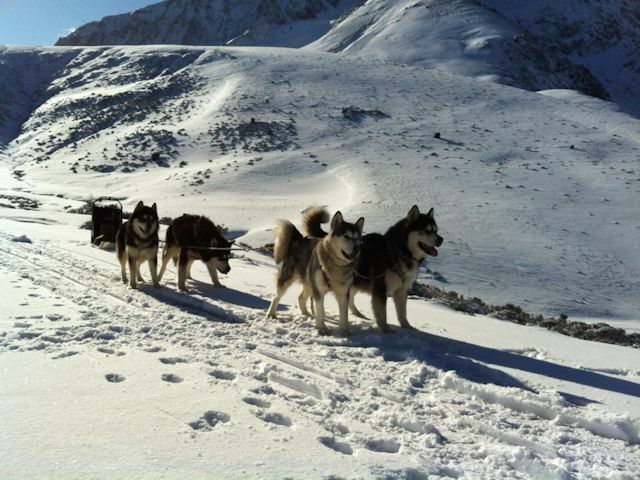 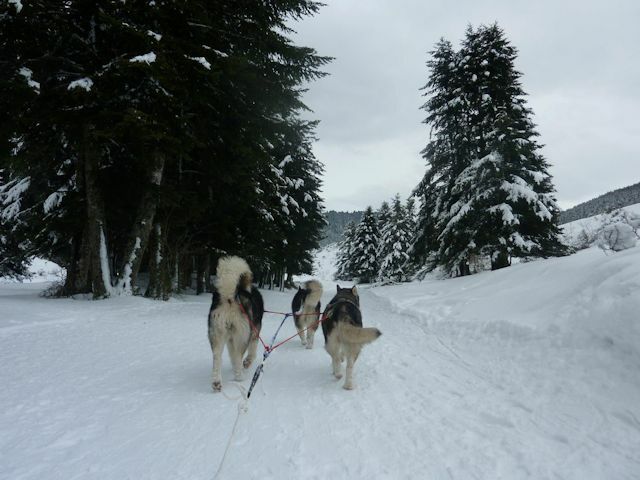 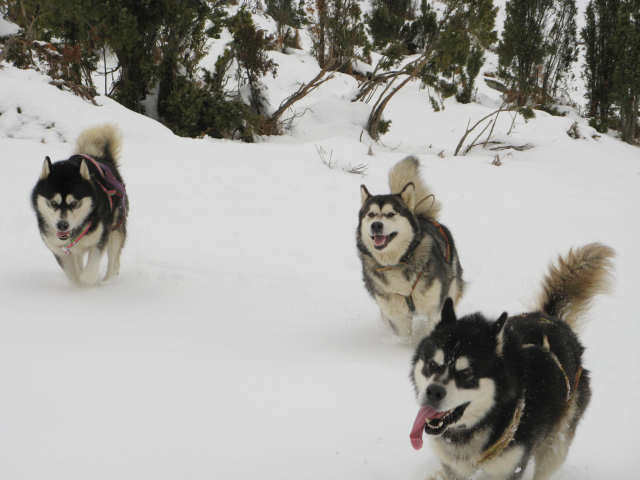 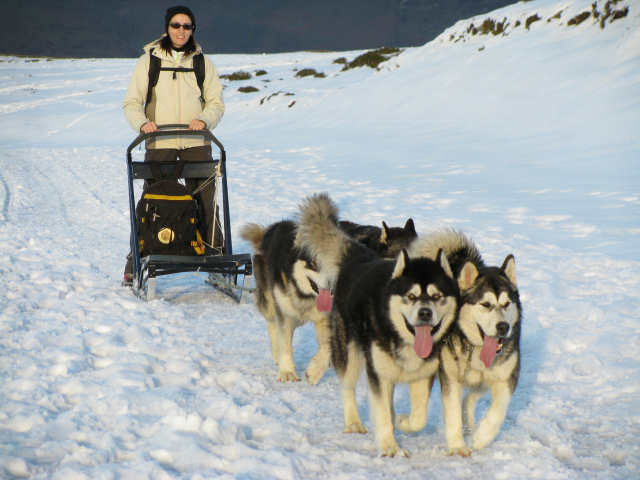 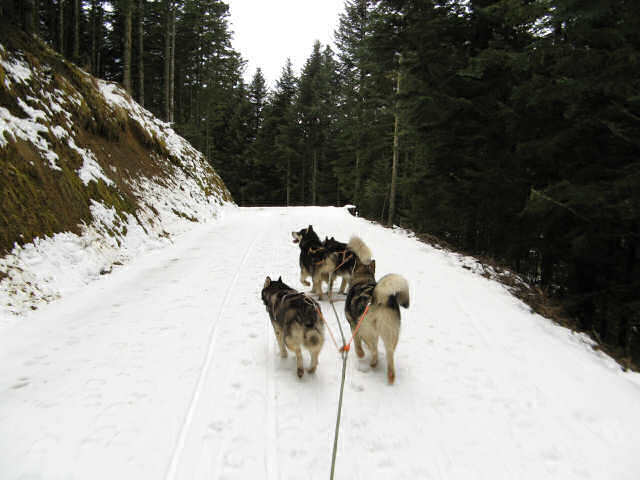 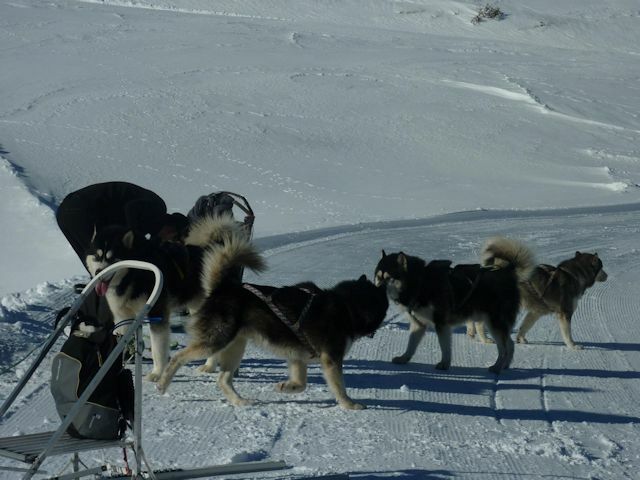 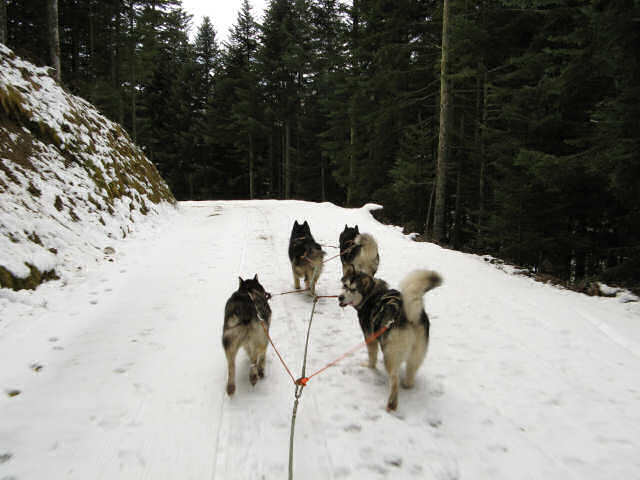 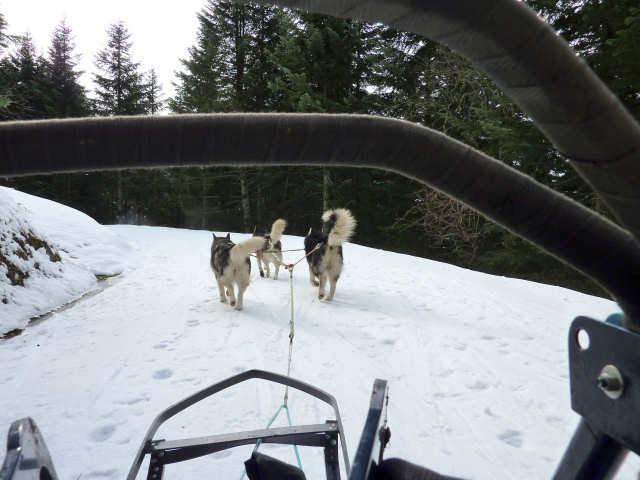 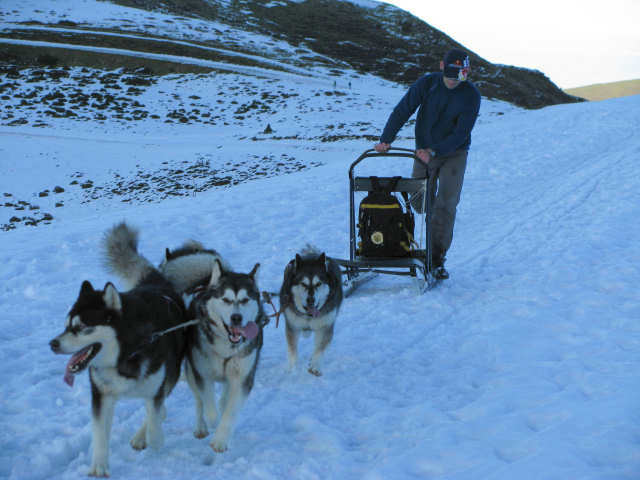 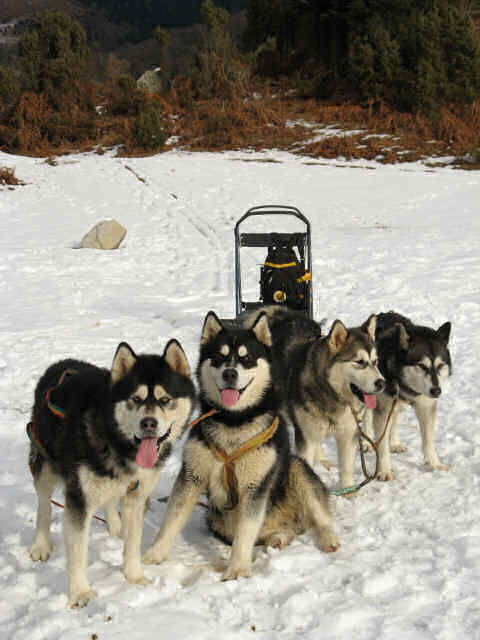 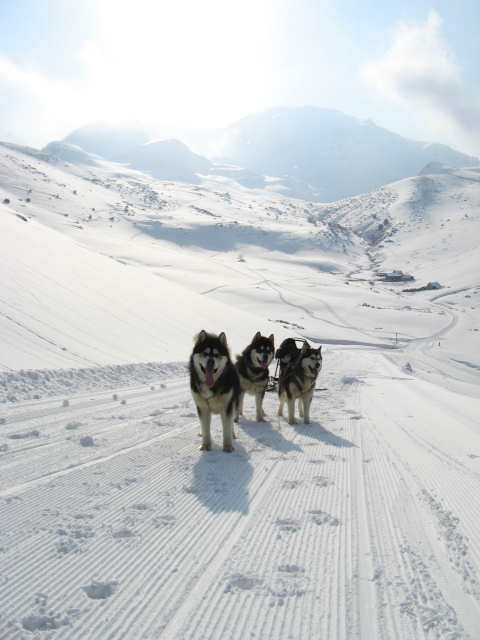 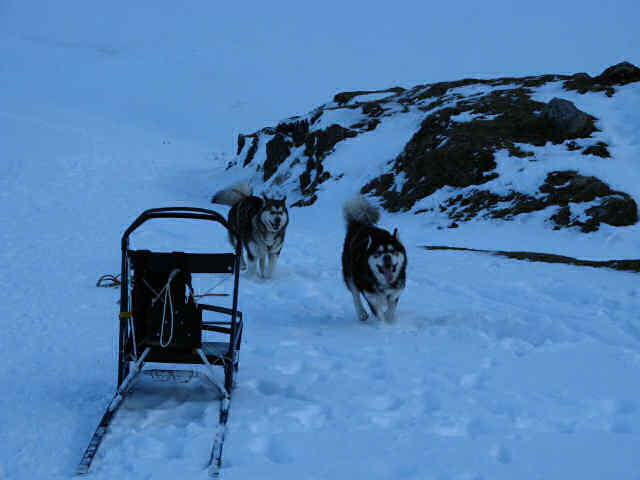 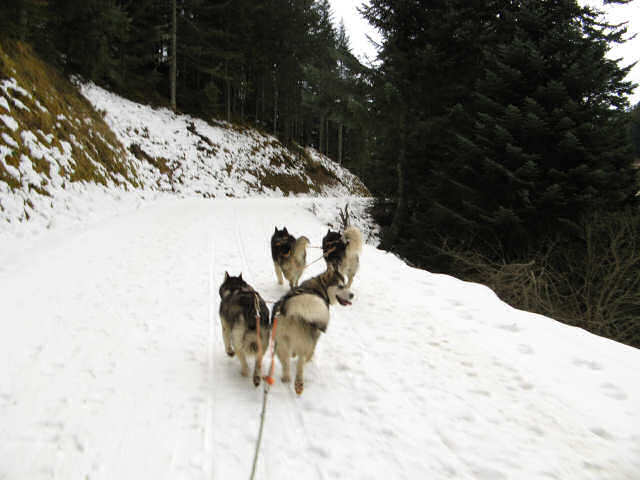 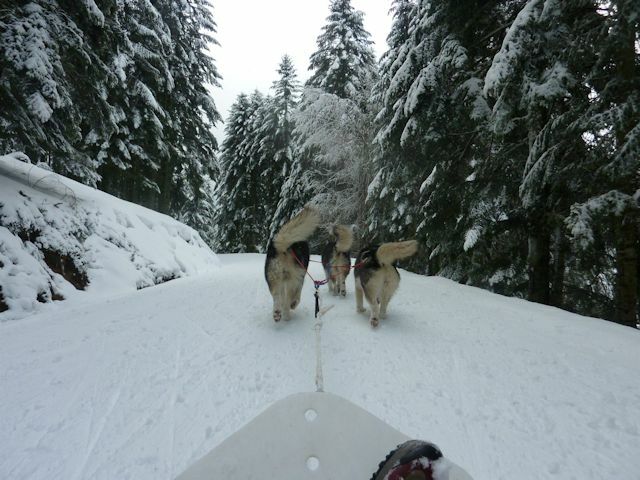 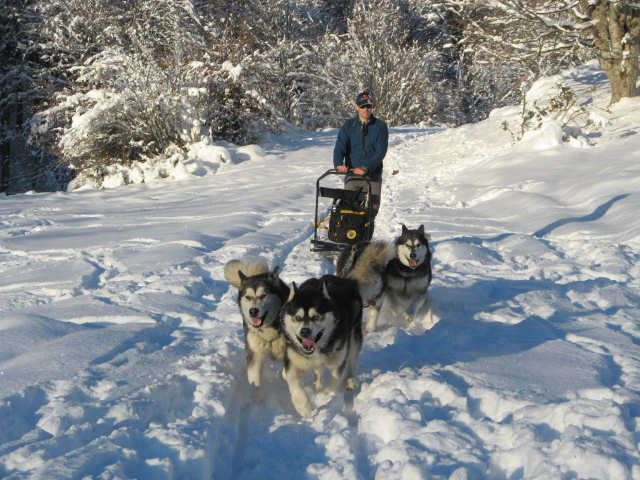 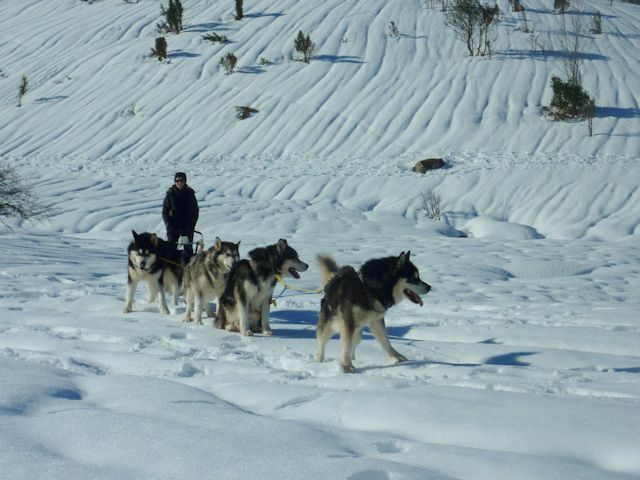 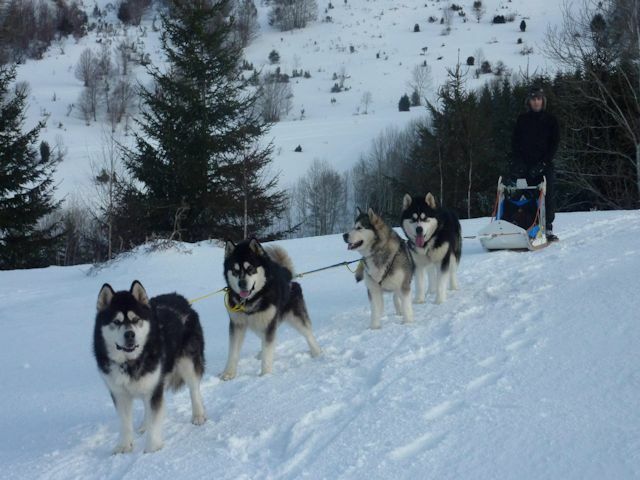 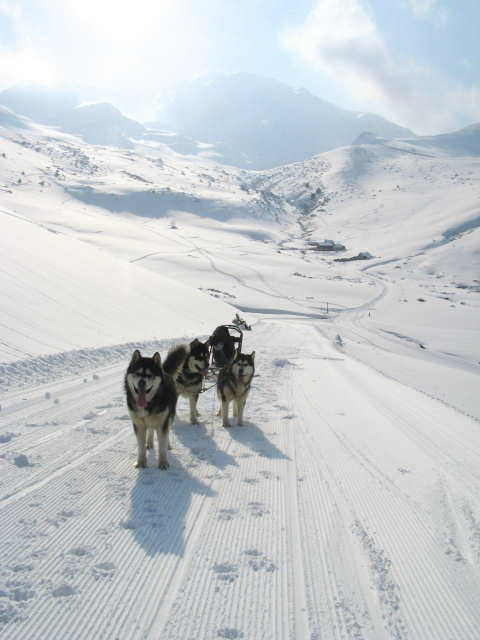 Following an another sled with 4 huskies. 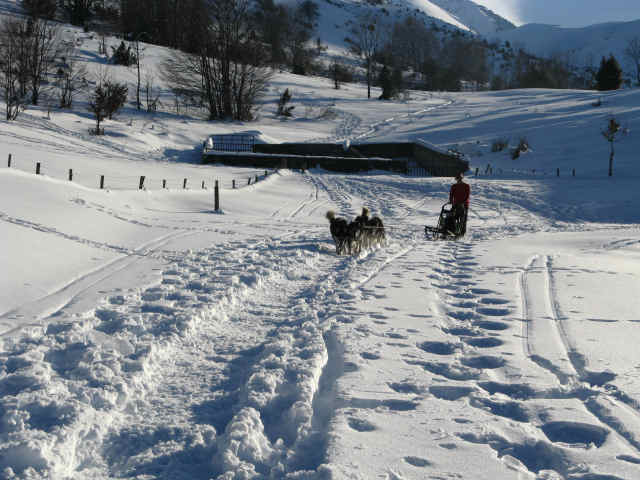 In returning from "Esclozes" around Payolle, Pyrénées, France. 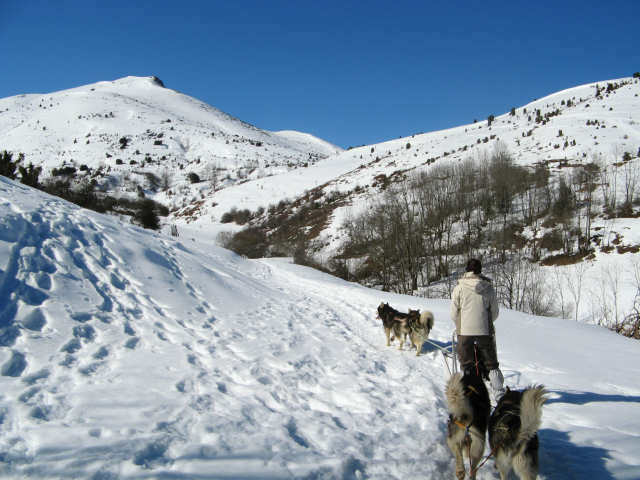 Always on the plateau of "Payolle", Pyrénnées, France. 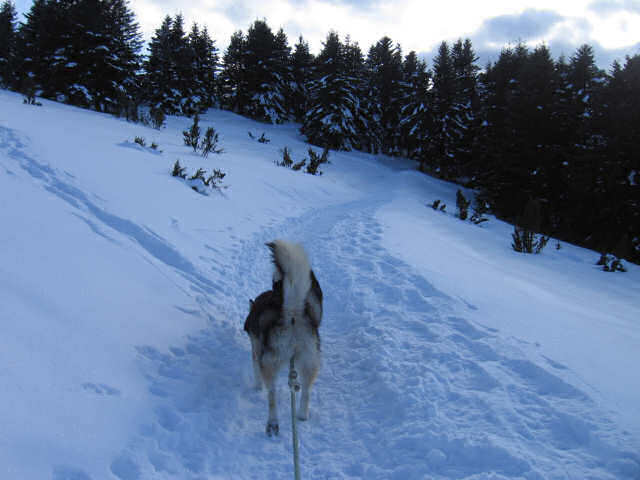 Going down to the Payolle lake. 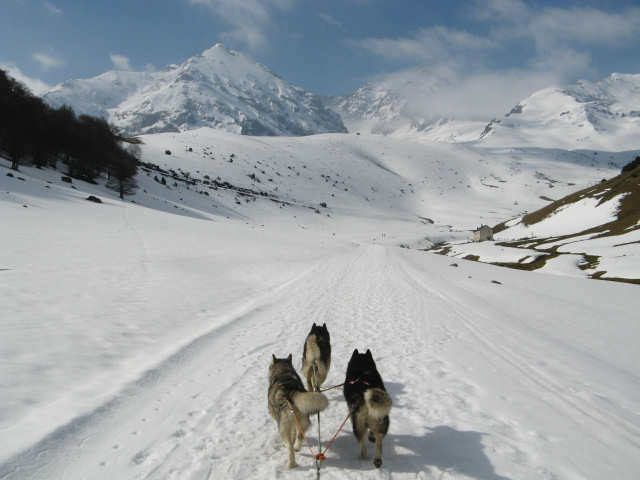 Above the \Esclozes" of Payolle. 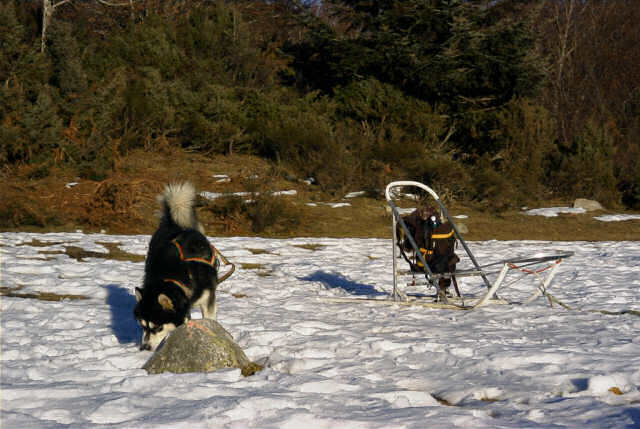 My girl friend on sled. 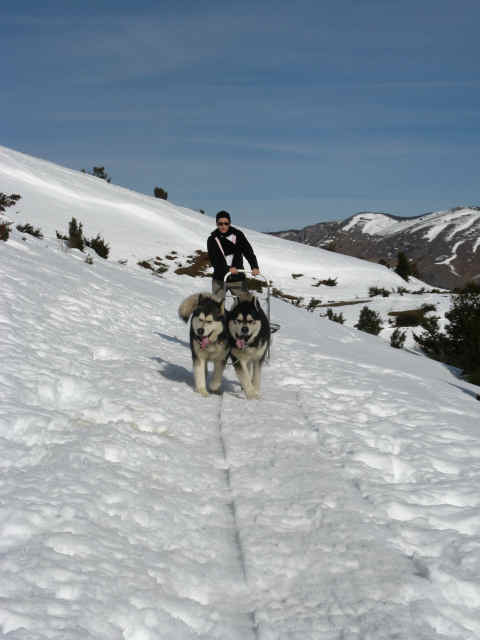 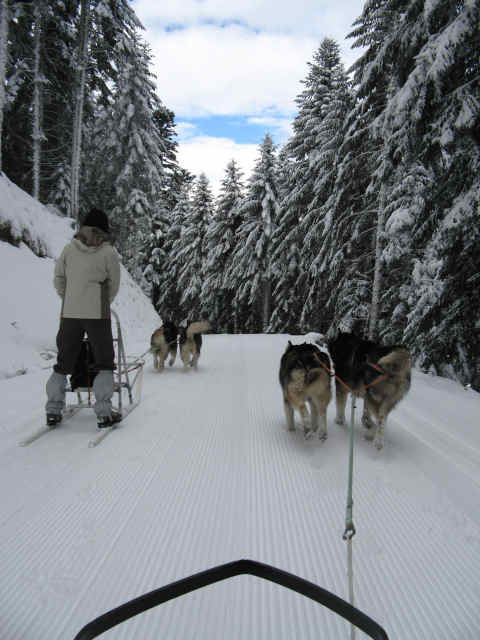 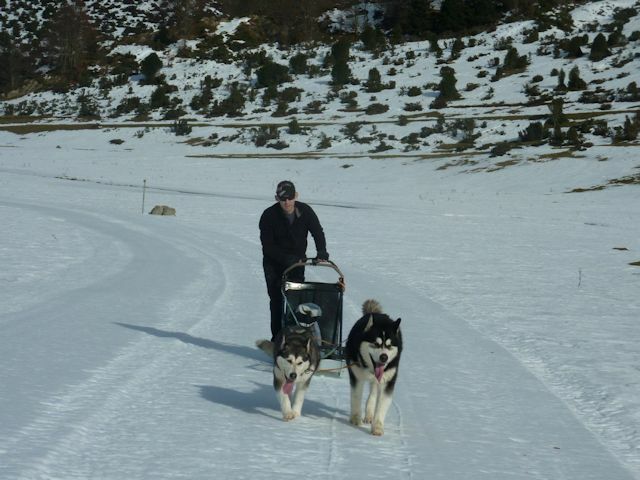 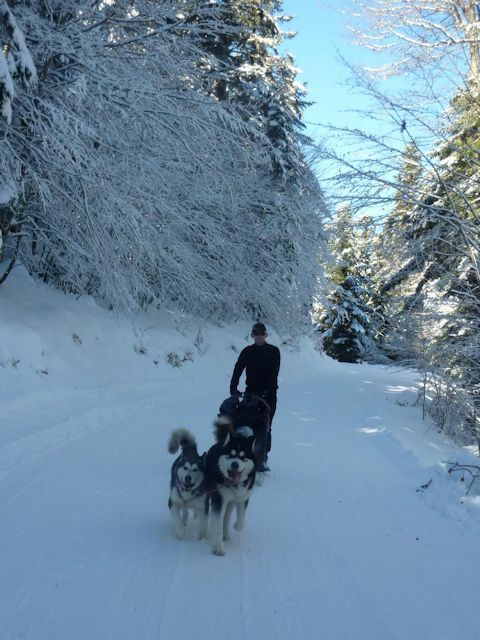 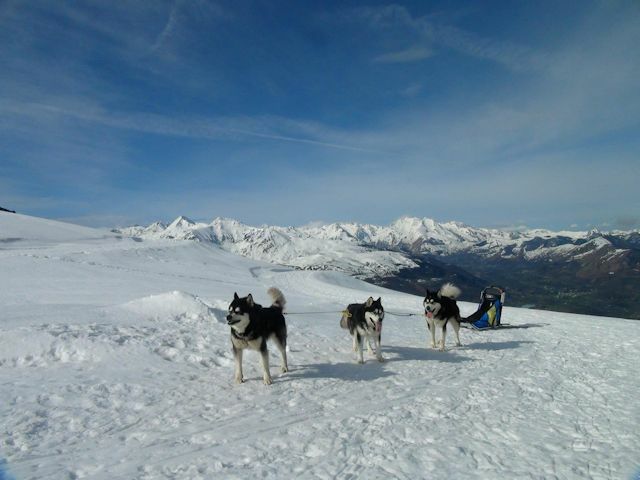 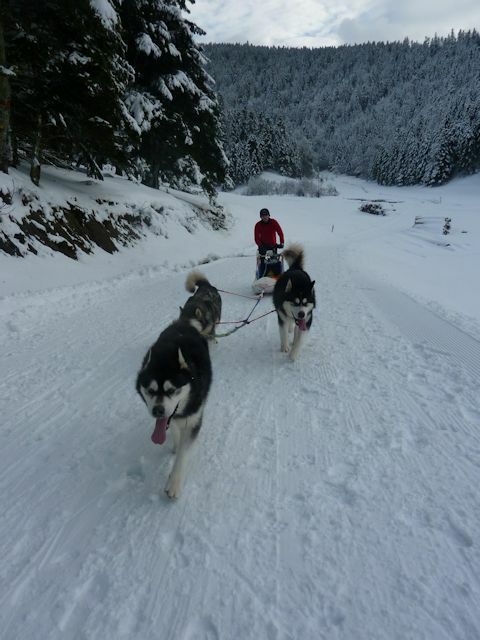 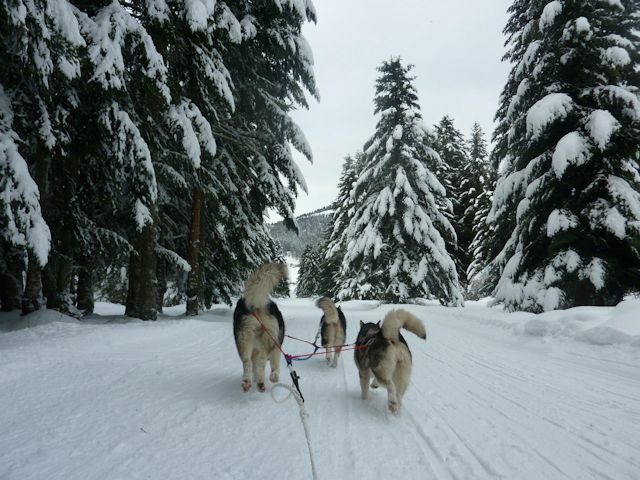 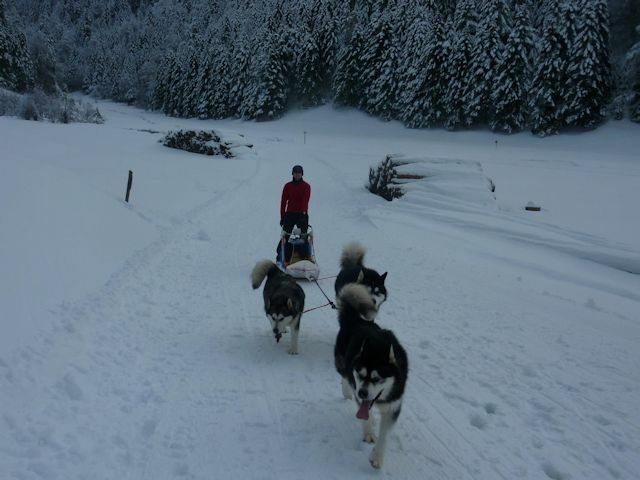 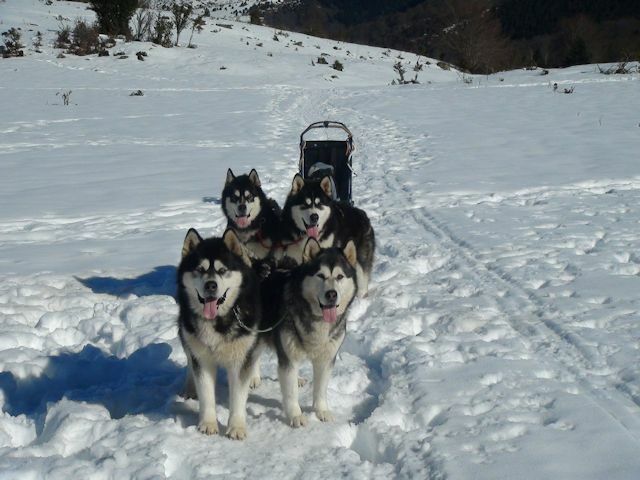 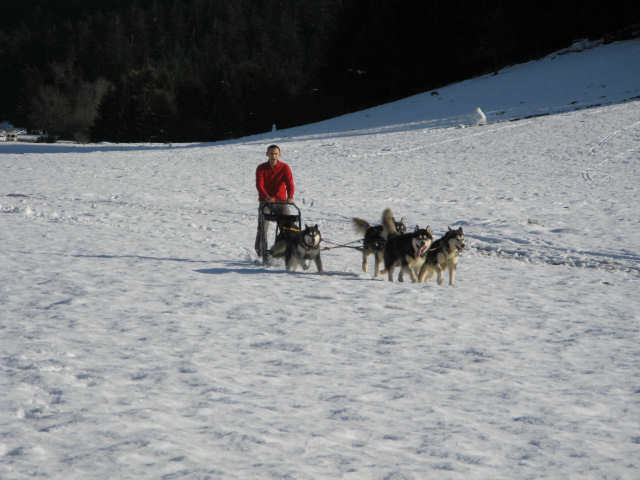 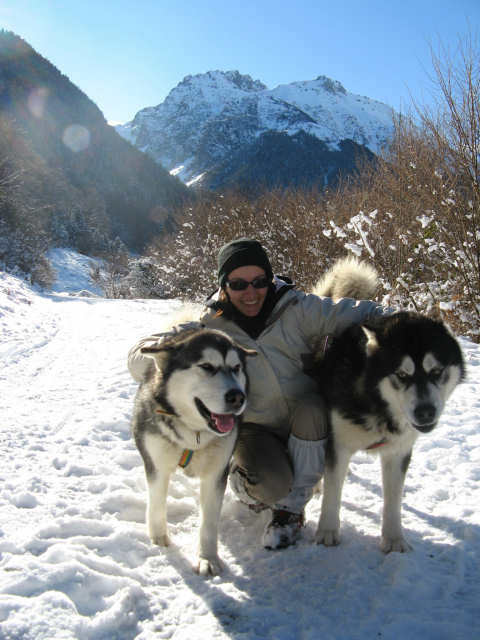 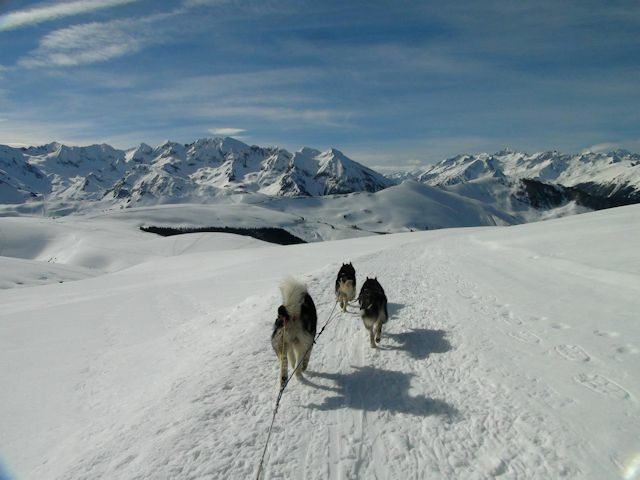 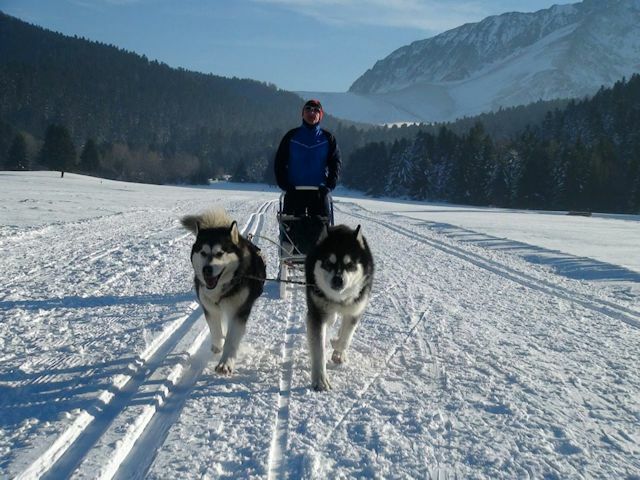 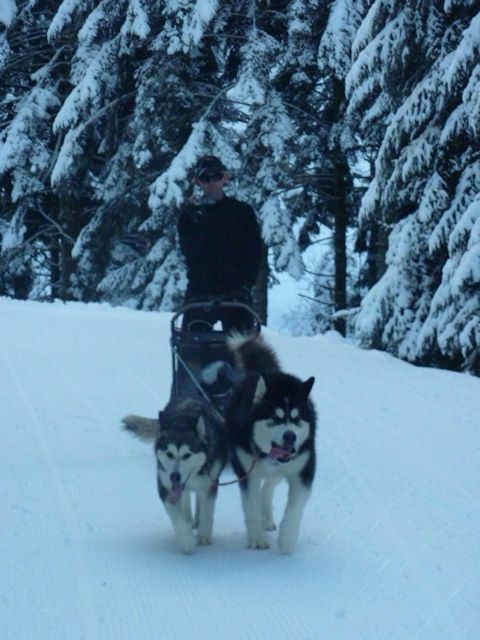 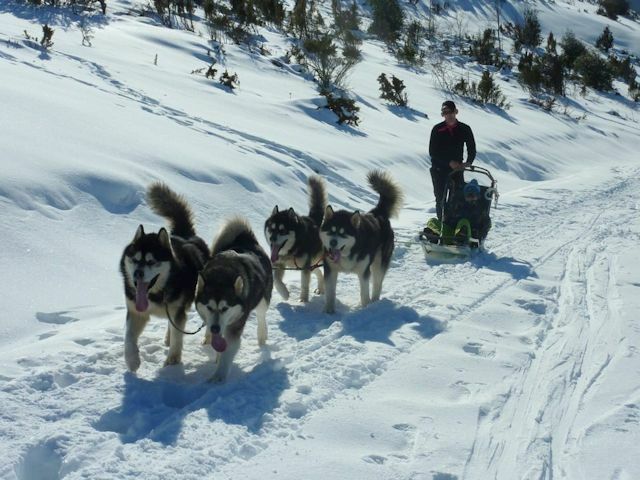 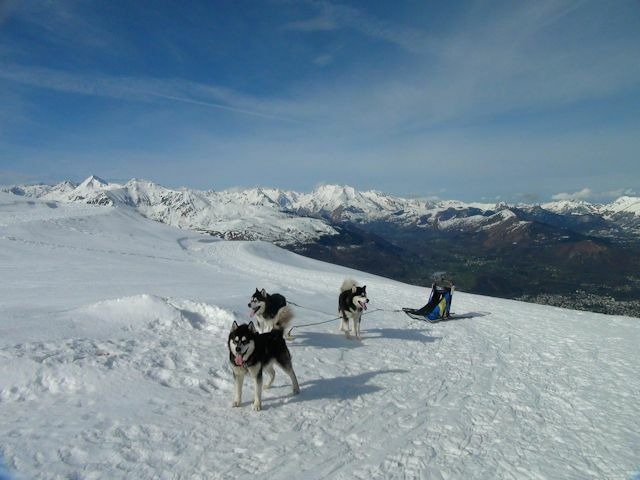 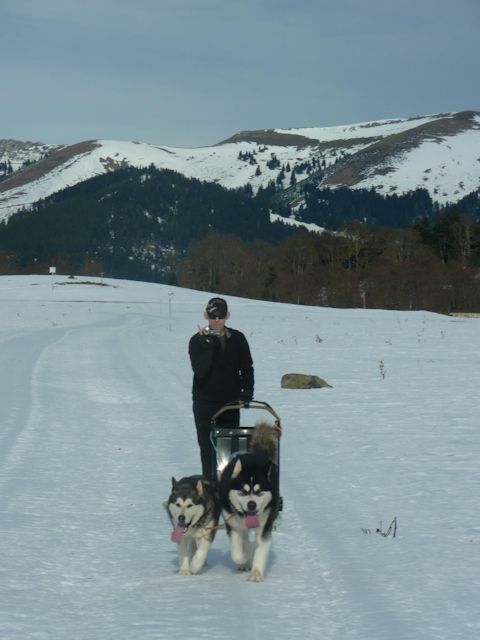 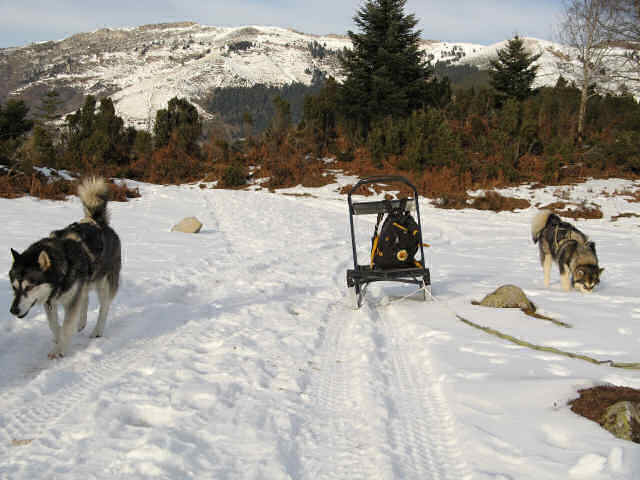 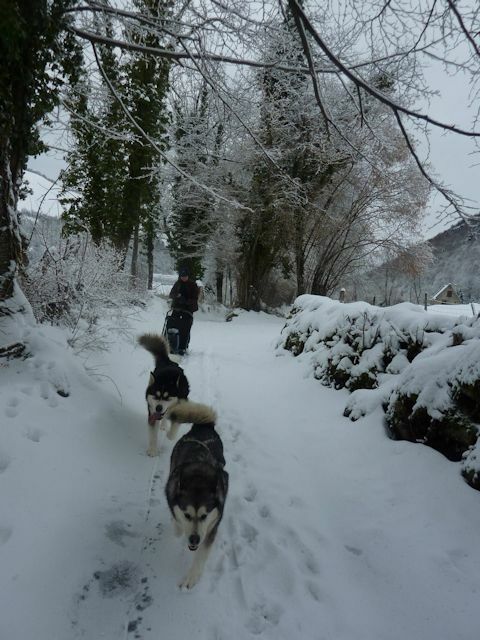 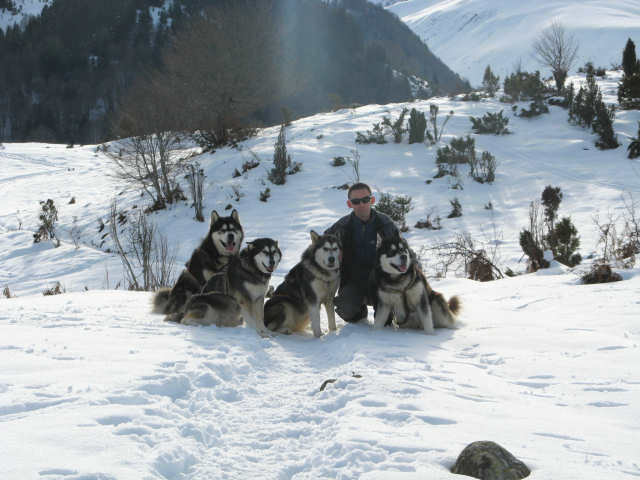 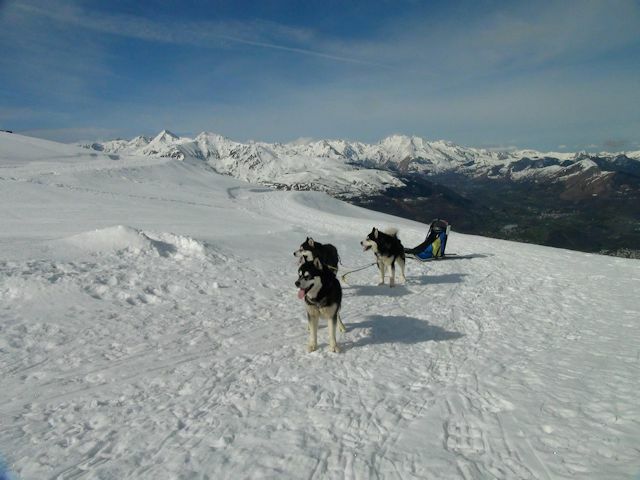 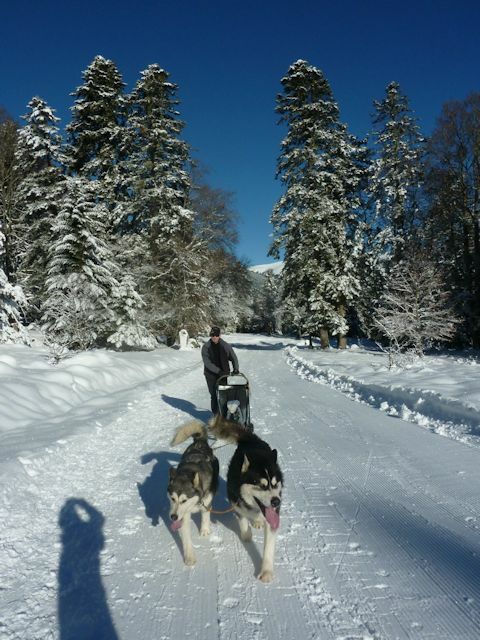 On the plateau of Payolle with 2 sleds, one for my girl friend and one for me. 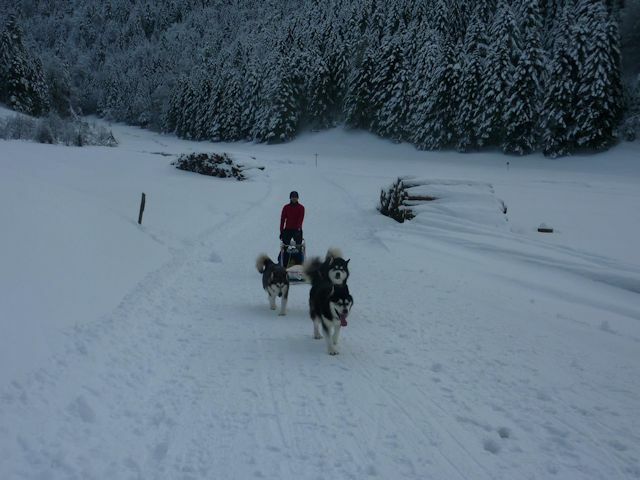 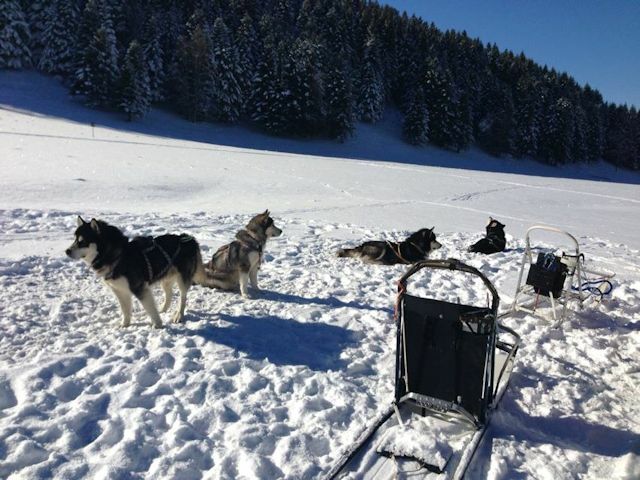 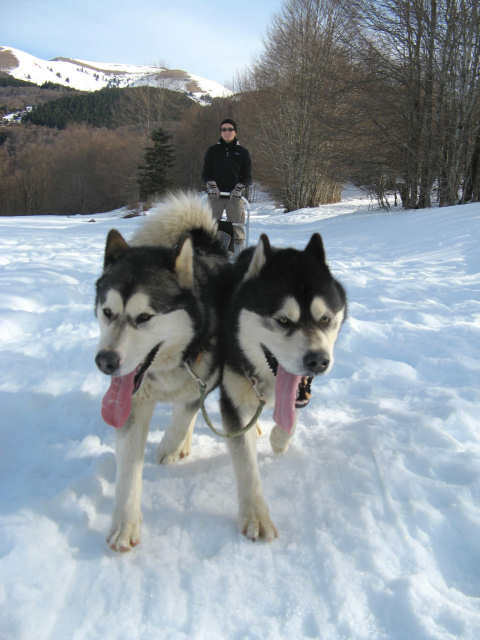 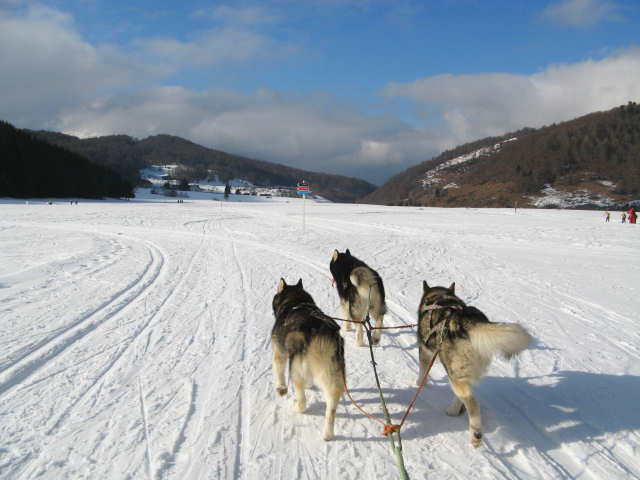 Arround the Payolle lake with 2 sleds, one for my girl friend and one for me. 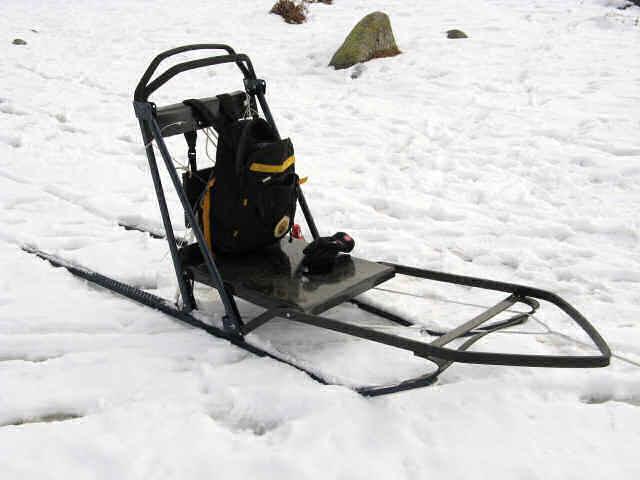 You have to run for sledding !!! 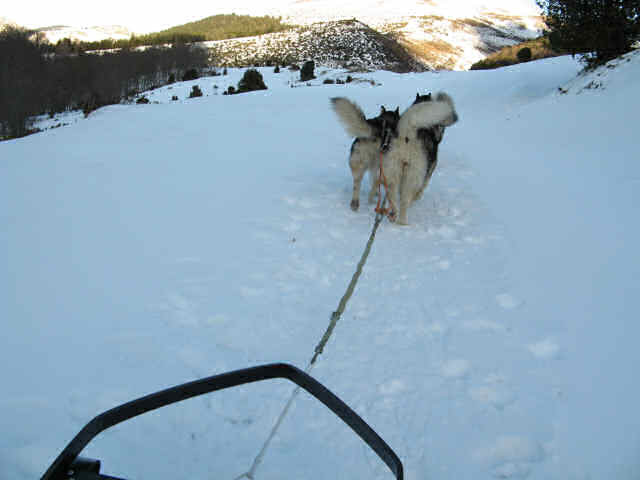 A another less rapid downhill.